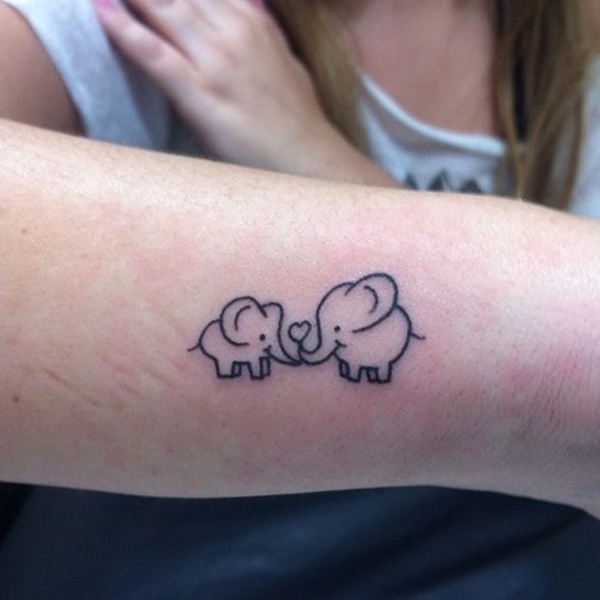 Elephants have fascinated humanity since our first encounter and as a result the animal is seen in popular culture, folklore, and religion. 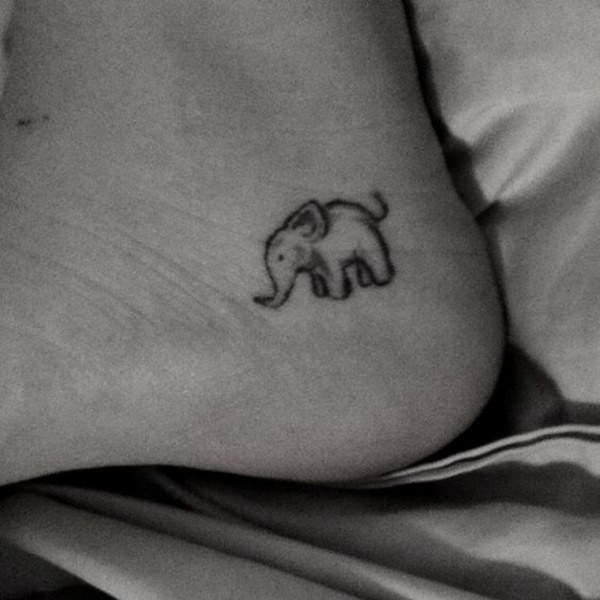 Elephants are heralded for their beauty, their power, their memory, and their close knit family bonds. All of which are qualities that are considered desirable by us bipeds. 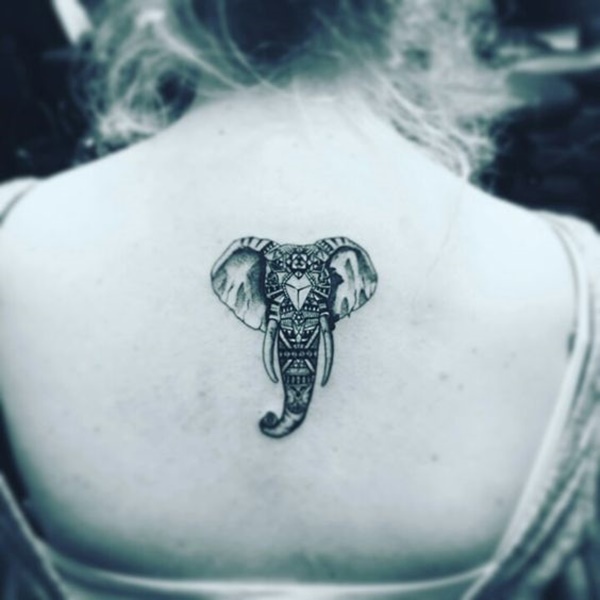 This article reviews tattoos that feature elephants as the main image and discusses what qualities will separate your tattoo from the herd. 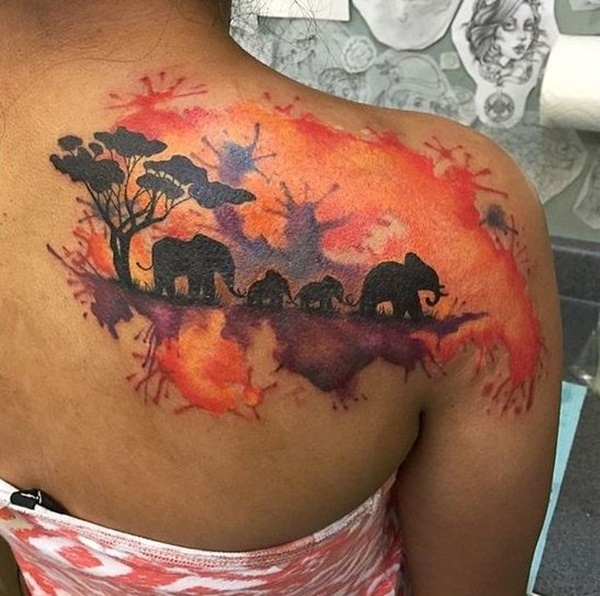 The silhouette of a herd of elephants walking trunk to tail is embellished with an array of watercolor smears. 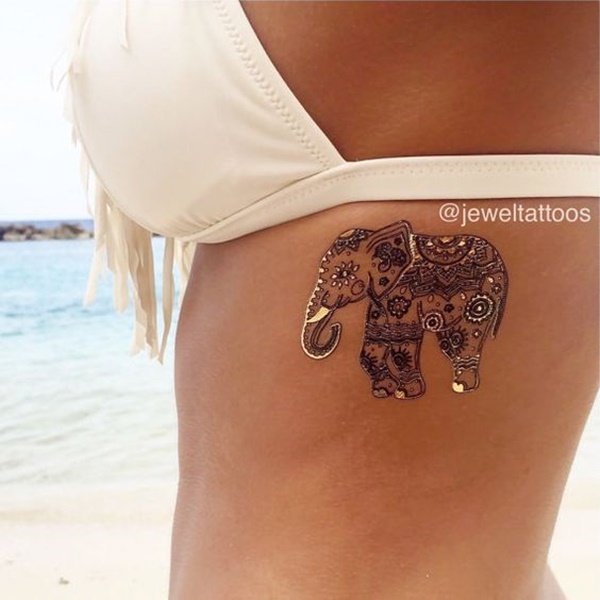 A simplistic rendition of an elephant is accented with mandala elements. 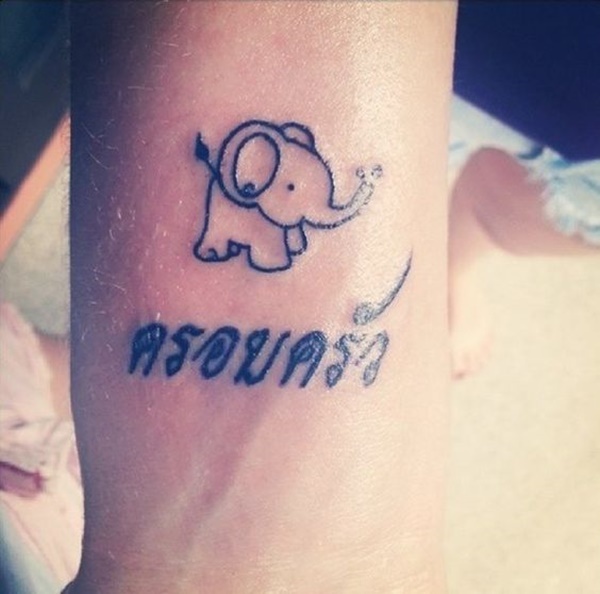 A cartoon style elephant sits above a quote in a language I don’t recognize. 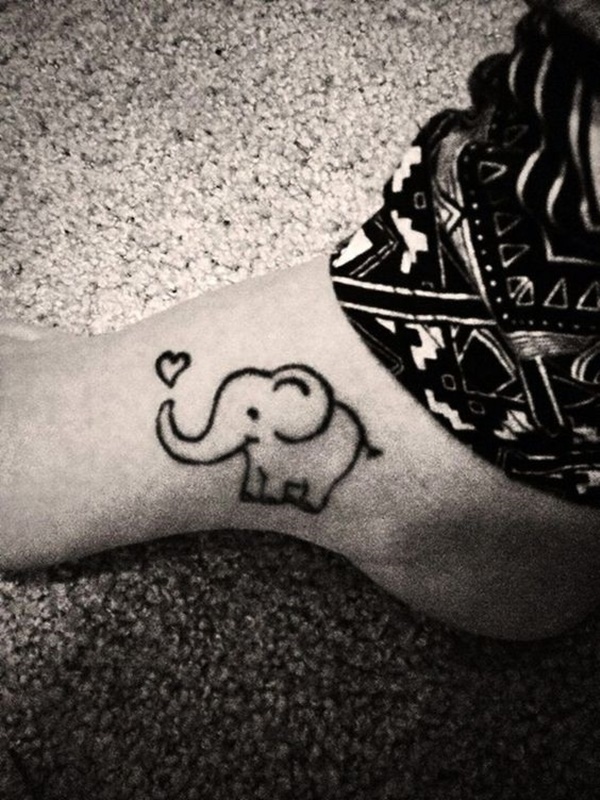 Another example of a cartoon elephant is rendered on the wearer’s heel in black ink. 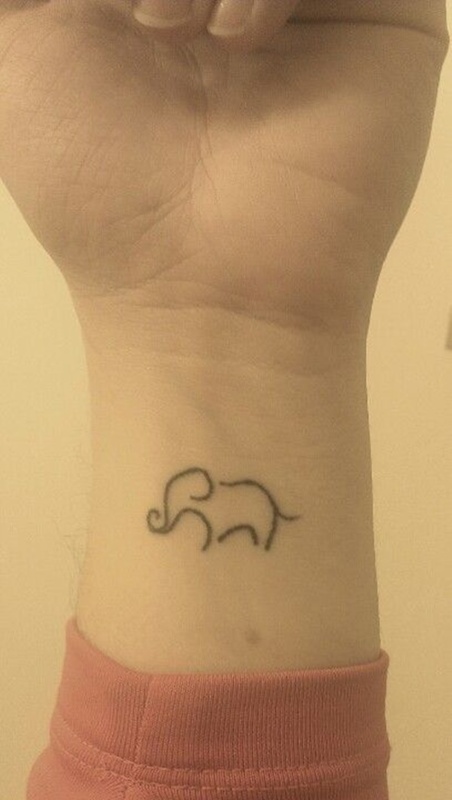 A simplified outline of an elephant is rendered on the wearer’s wrist in black ink. 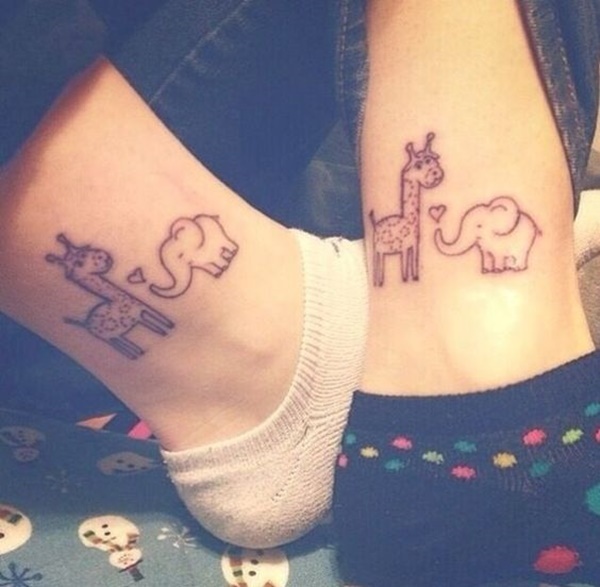 A cartoon elephant and giraffe are rendered on the wearers’ ankles with a heart protruding from the elephant’s trunk to convey the love shared between the animals. 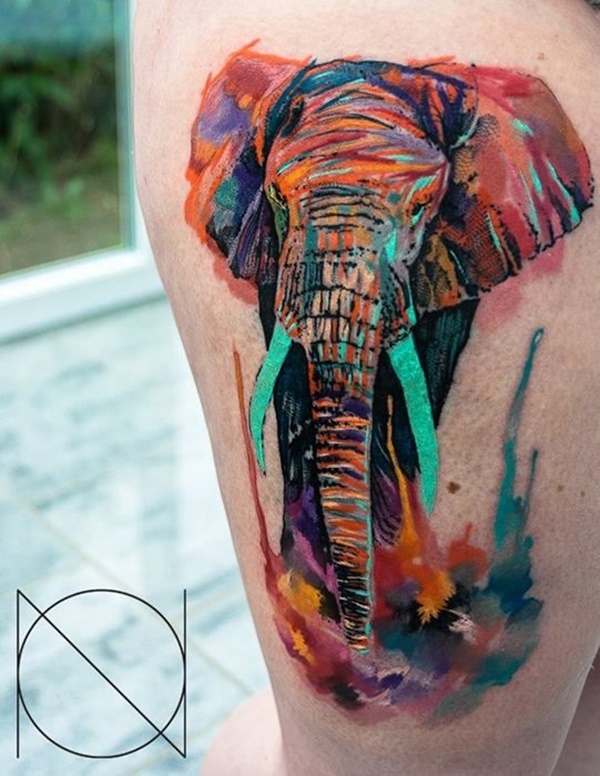 This stunning portrait of an elephant utilizes a vast array of colors to create the very complex and striking piece. 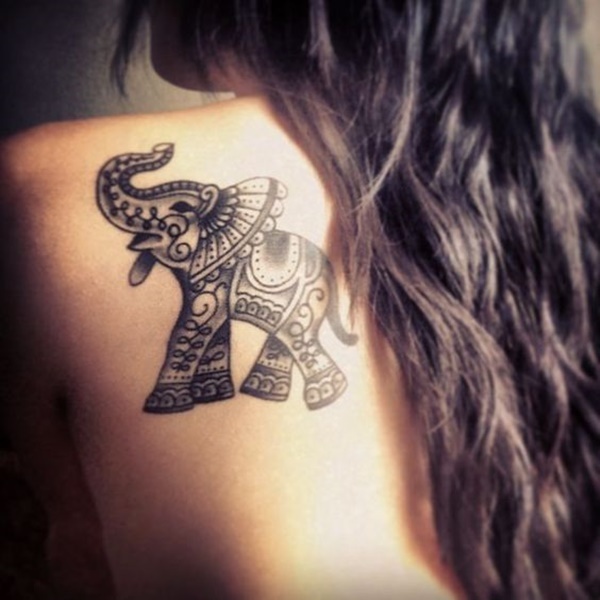 The head of an elephant is portrayed covered in a pattern reminiscent of those seen on a mandala in this black tattoo. 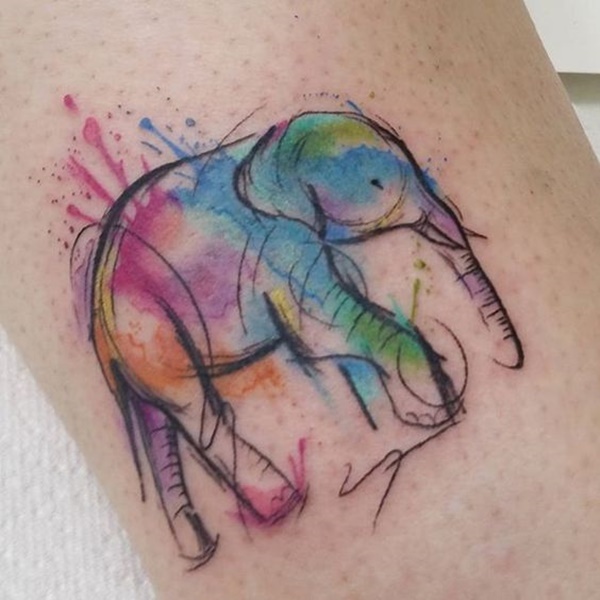 An elephant is portrayed in a sketch style with watercolor smears that utilize a varied palette of colors. 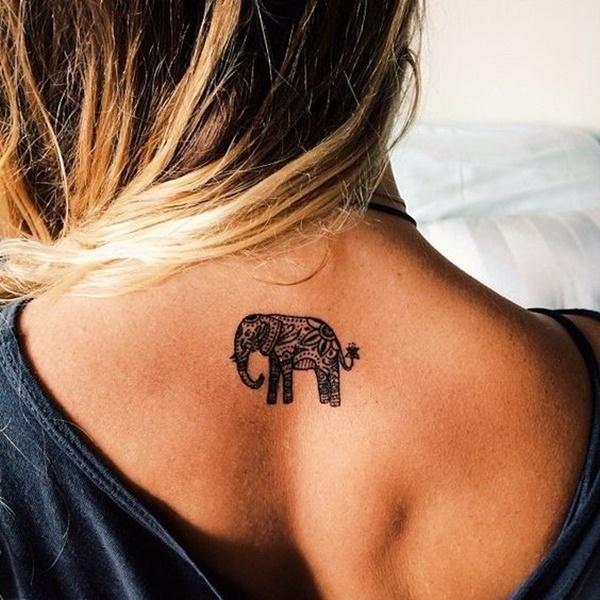 Another example of an elephant covered in a pattern popularly seen on mandalas is seen in this black tattoo. 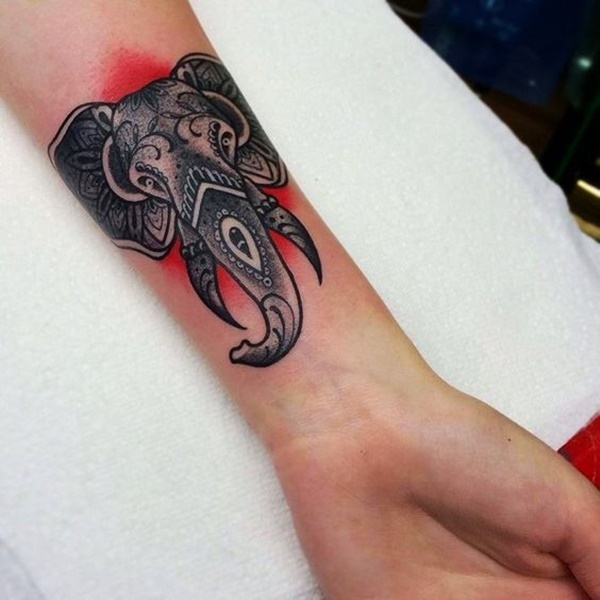 This hyper-stylized tattoo shows an elephant adorned with an intriguing black and red pattern that draws the eye to the piece. 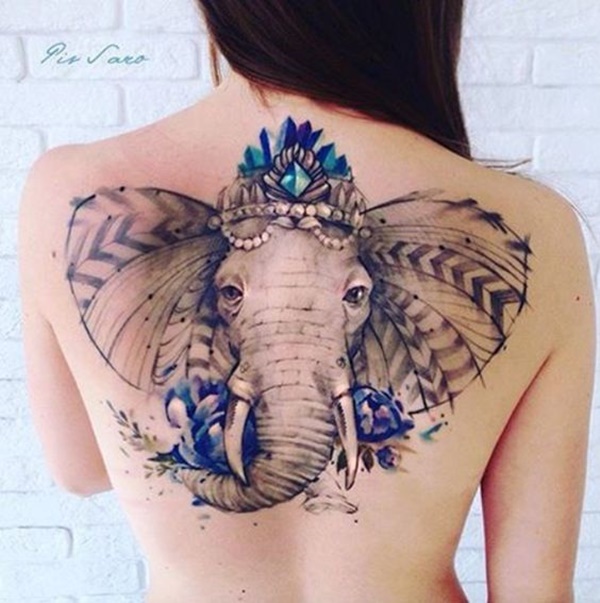 An elephant wears a bejeweled crown and is embellished with blue colors, pearls, and a pattern of repeating arrows along the ears. 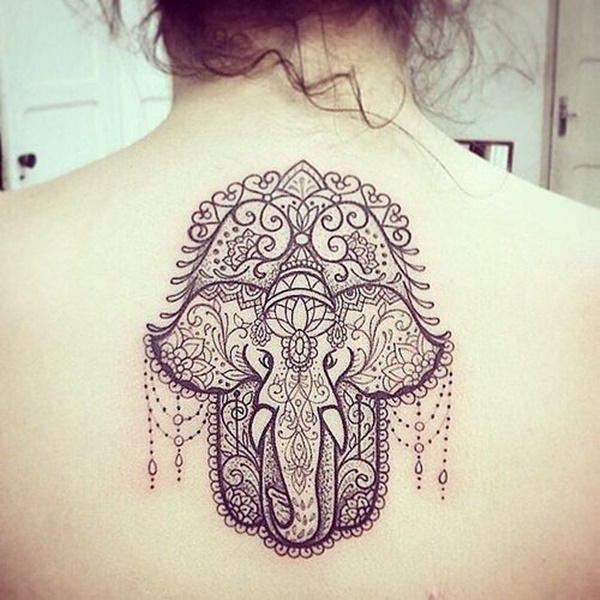 Another example of an elephant with mandala patterns is depicted in black and white ink. 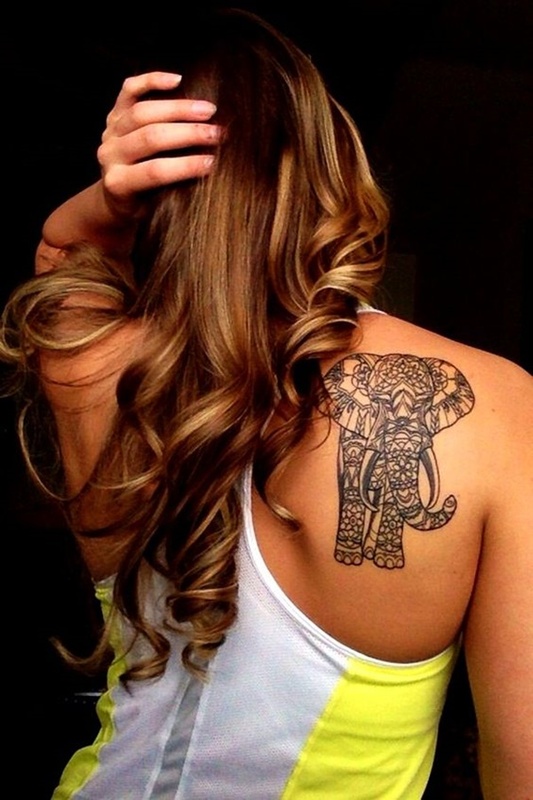 A stylized head of an elephant is portrayed with a flower crown and accents running along the trunk and tusks. 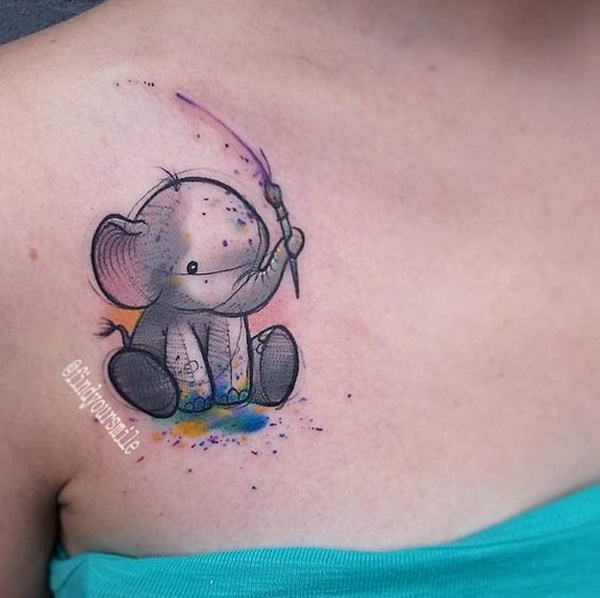 An adorable cartoon-style elephant is portrayed in front of a background consisting of a blue and purple smear. 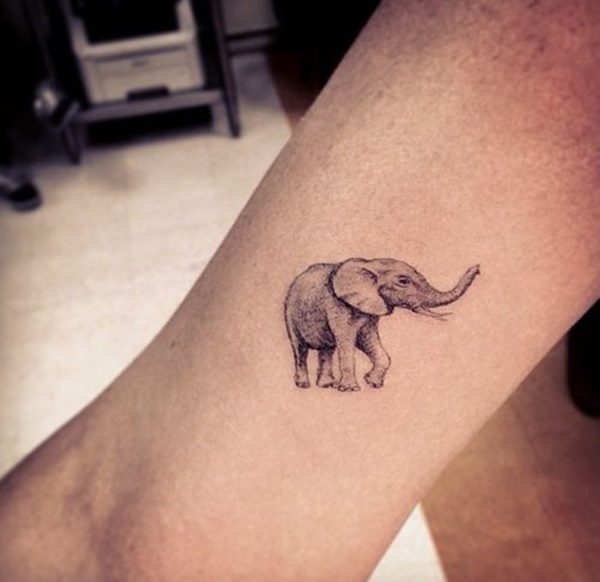 A simplified rendering of an elephant is portrayed in black ink above the wearer’s elbow. 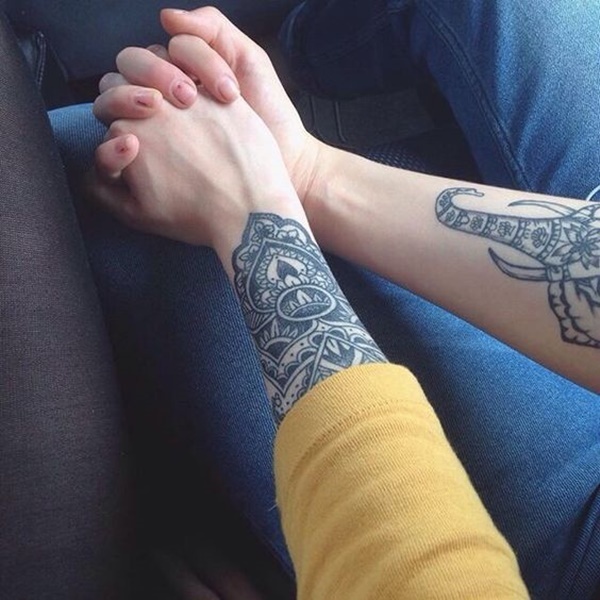 Another example of an elephant covered in a mandala pattern is shown with its trunk ascending up the wearer’s wrist and onto their hand. 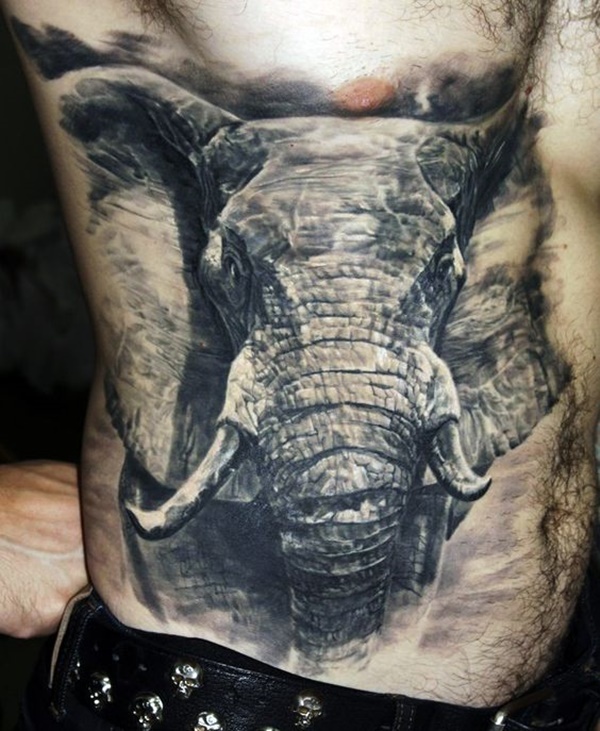 A hyper-realistic portrait of an elephant is portrayed in black and gray ink on the right side of the wearer’s torso. 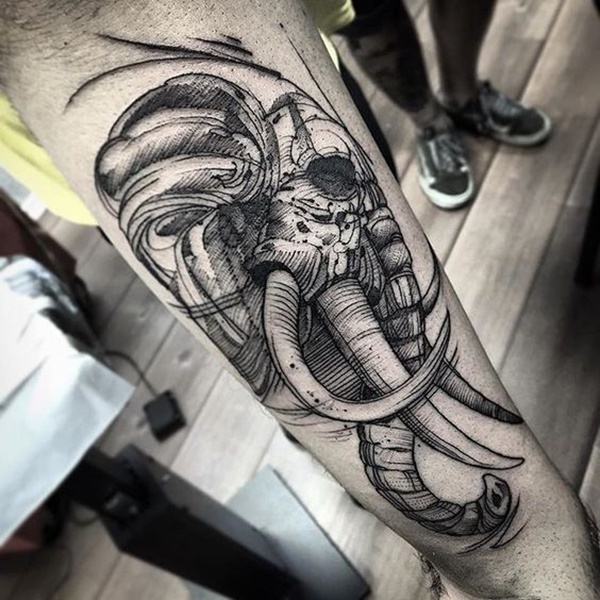 A stylized portrait of an elephant skull is portrayed in black and gray ink on the wearer’s forearm. 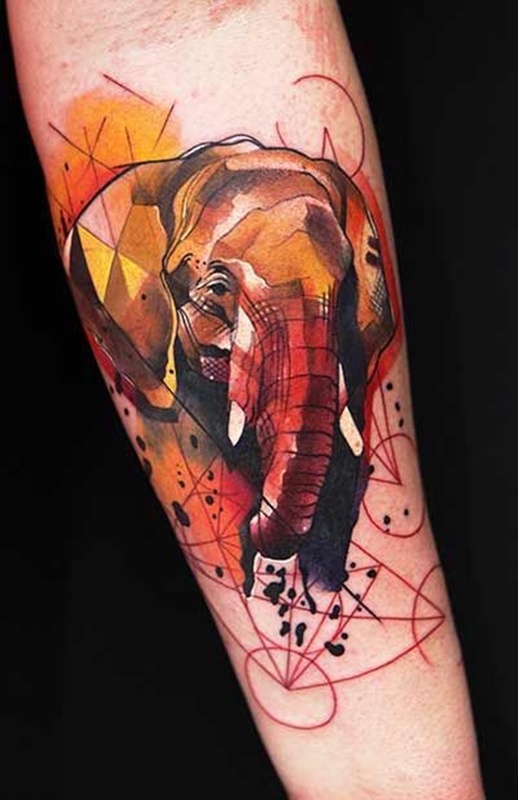 A portrait of an elephant is created using a color palette of red and yellow and is embellished with geometric shapes at the base of the image. 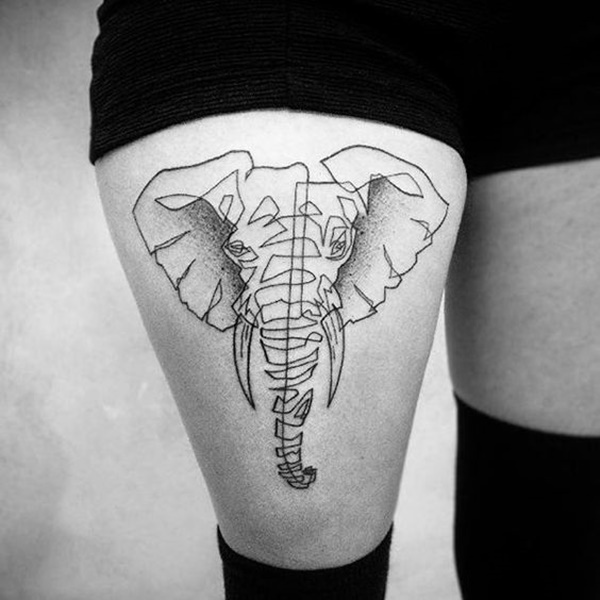 An elephant portrait is created using a single line in this black and gray tattoo portrayed on the wearer’s right thigh. 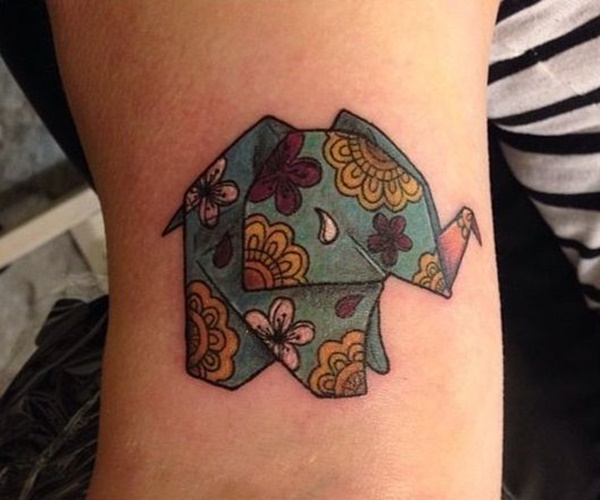 An origami elephant is accented with mandala elements and colored with a palette including blue, yellow, pink, purple, and white. 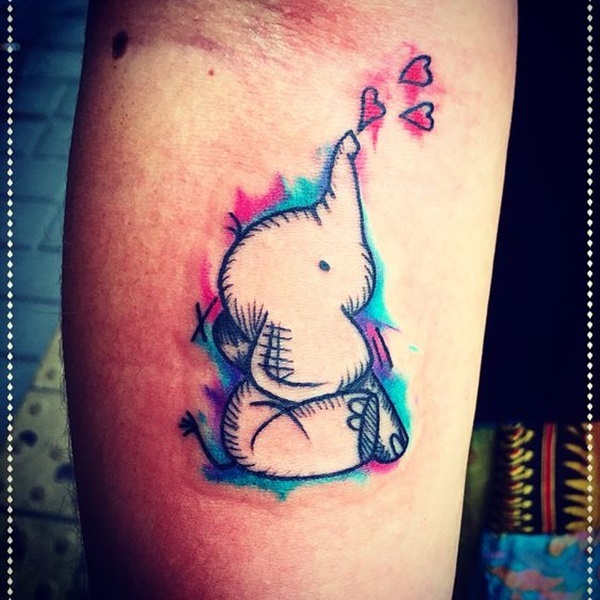 A jumping elephant with a heart attached to its trunk is accented with a varied array of watercolors. 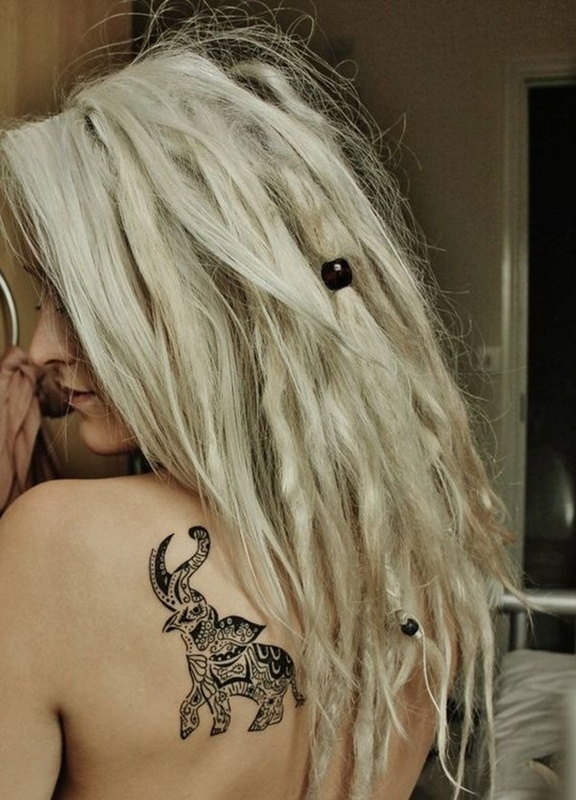 An elephant is embellished with a mandala pattern and hanging beads in this black tattoo rendered in the middle of the wearer’s upper back. 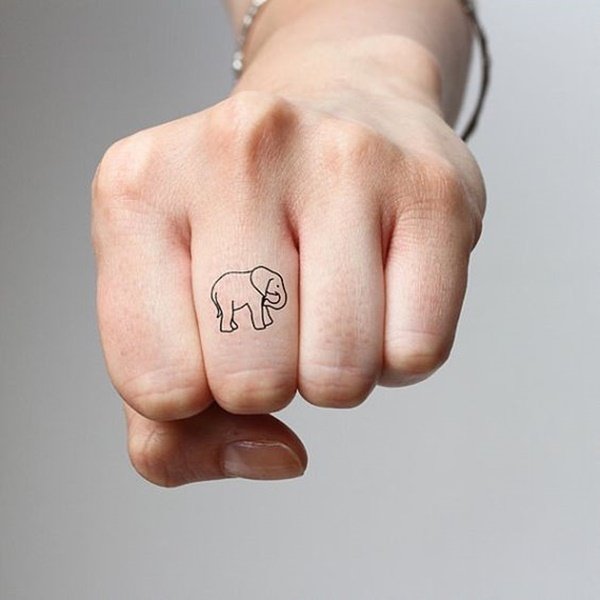 A simplistic rendition of an elephant is portrayed on the wearer’s middle finger in black ink. 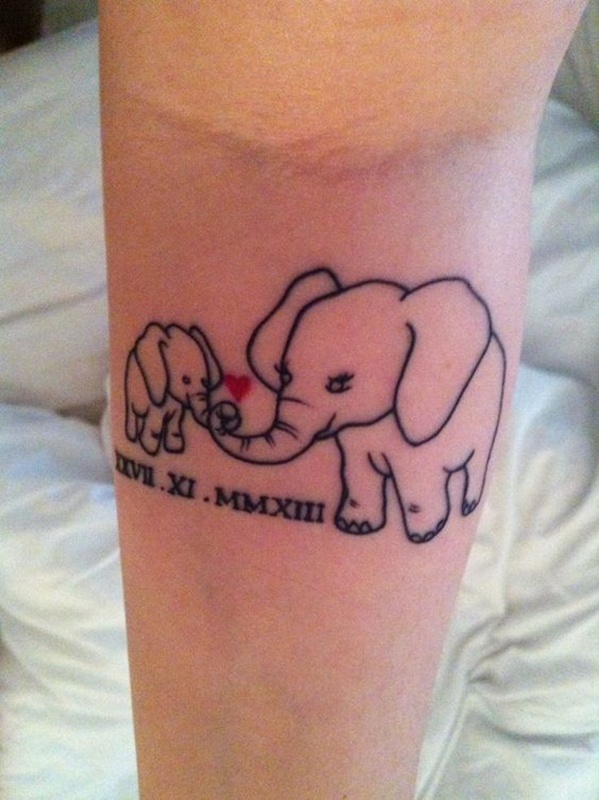 A mother elephant and her baby are shown embracing trunks above a series of roman numerals denoting a birthday. 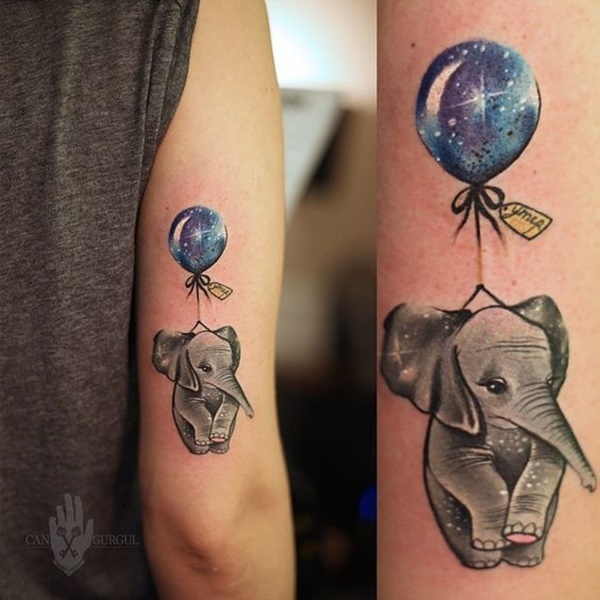 An elephant is attached to a balloon filled with a cosmic pattern in this obscure tattoo. 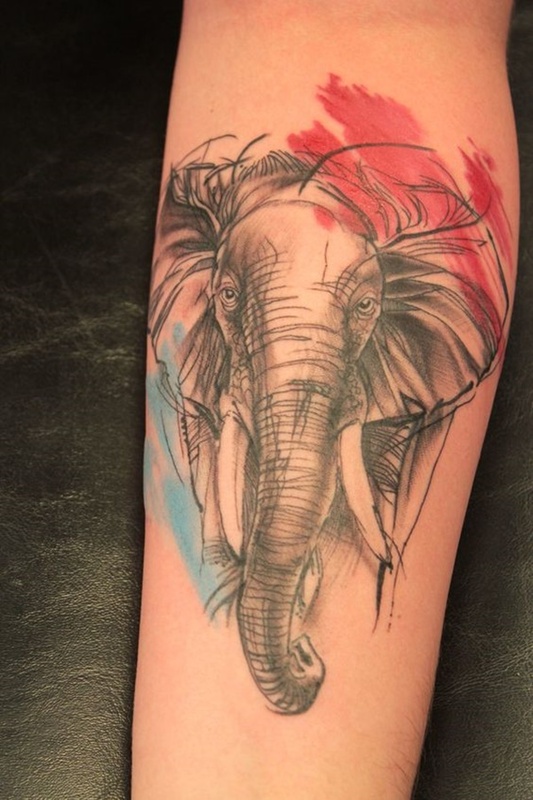 A black and gray portrait of an elephant is accented with a blue smear and red smear on the lower left and upper right sides, respectively. 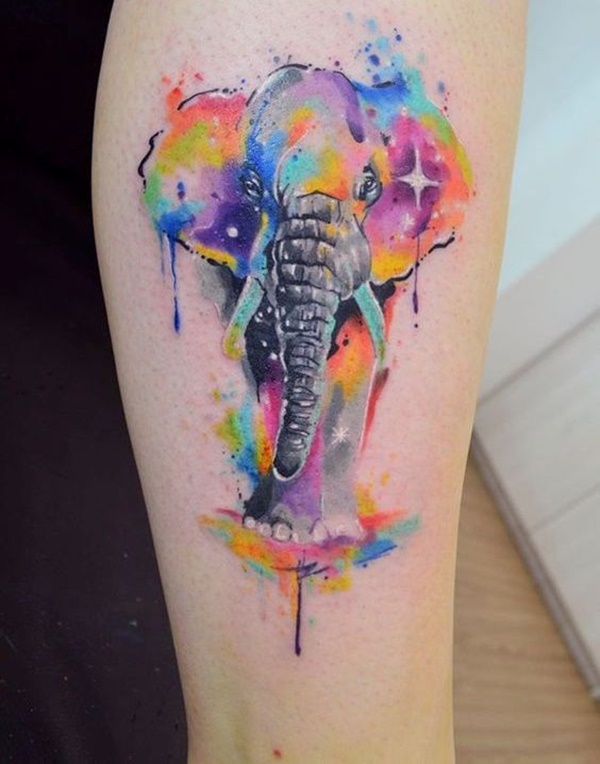 An elephant portrait is colored with vivid watercolor smears in this tattoo that utilizes a vibrant palette to add complexity to the piece. 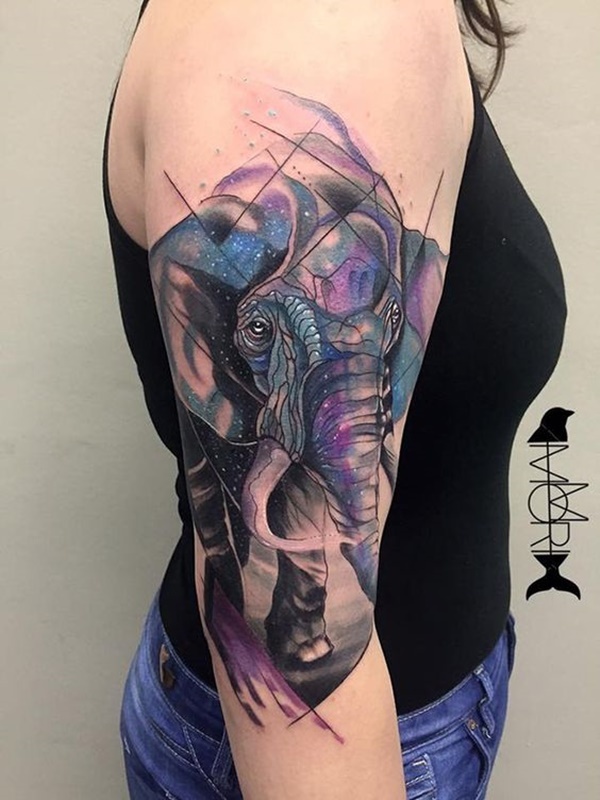 An elephant portrait is created using a palette of blue and purple and is embellished with white dots reminiscent of stars in the night sky. 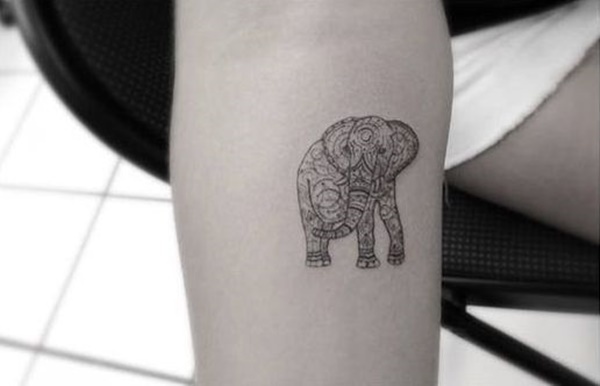 An elephant is comprised of a series of geometric shapes and is patterned with bold lines in this black tattoo. 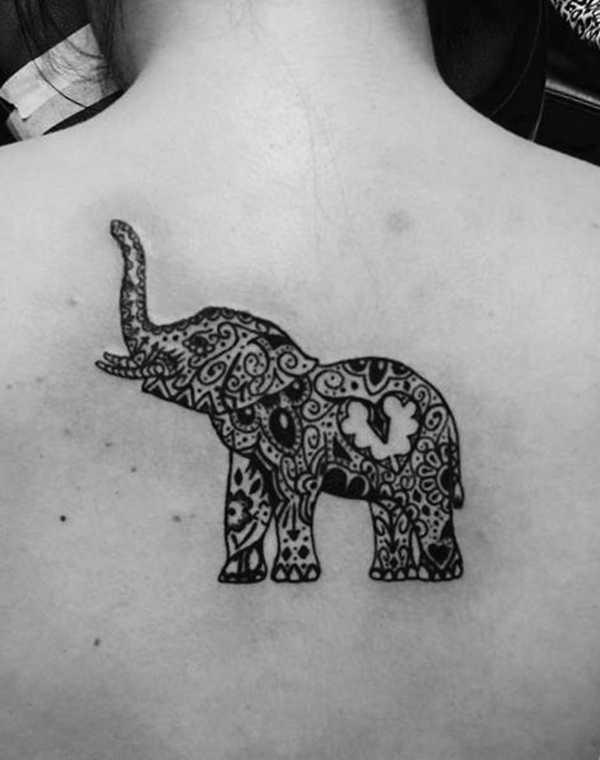 A cartoon style elephant is covered in a mandala pattern in this black tattoo rendered on the wearer’s left shoulder blade. 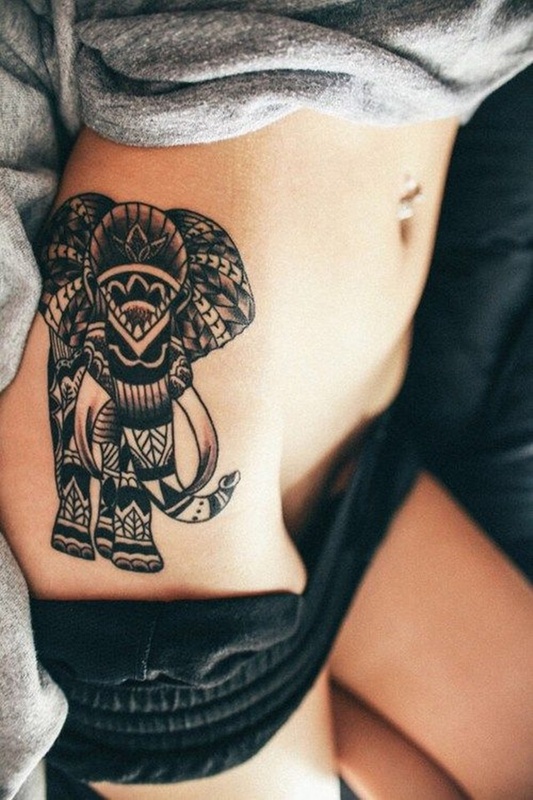 An elephant is stylized with an ornate pattern in this black tattoo. 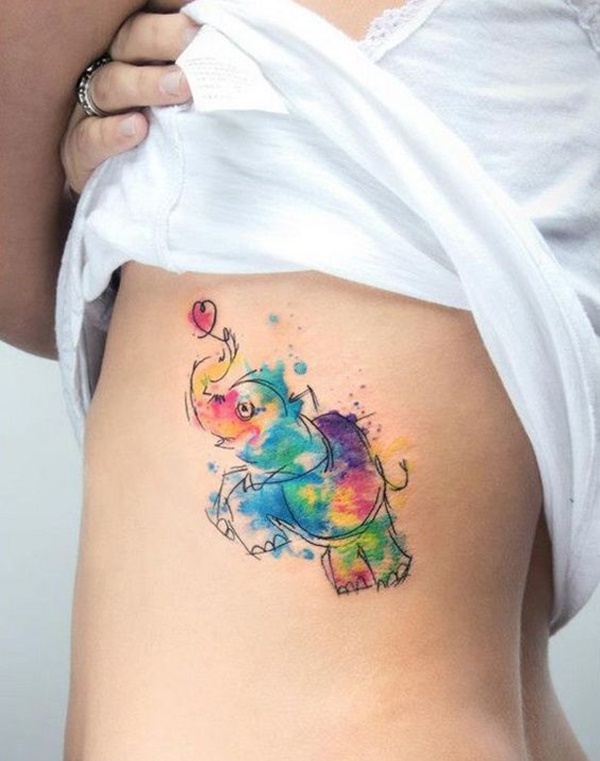 A cartoon style elephant holds a paint brush with its trunk in this tattoo embellished with watercolor smears. 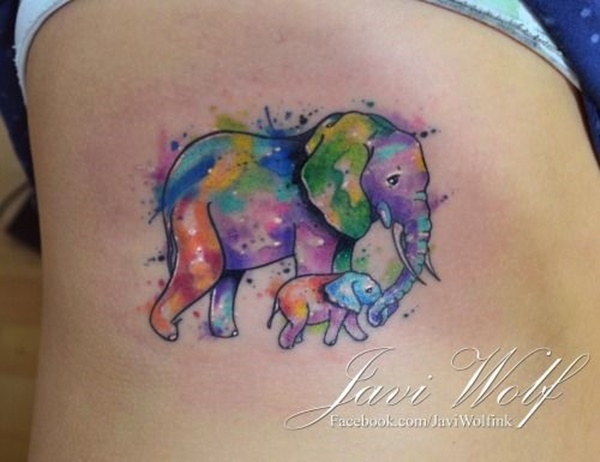 A mother elephant is shown walking with her baby, both animals are colored with a vibrant collection of watercolors. 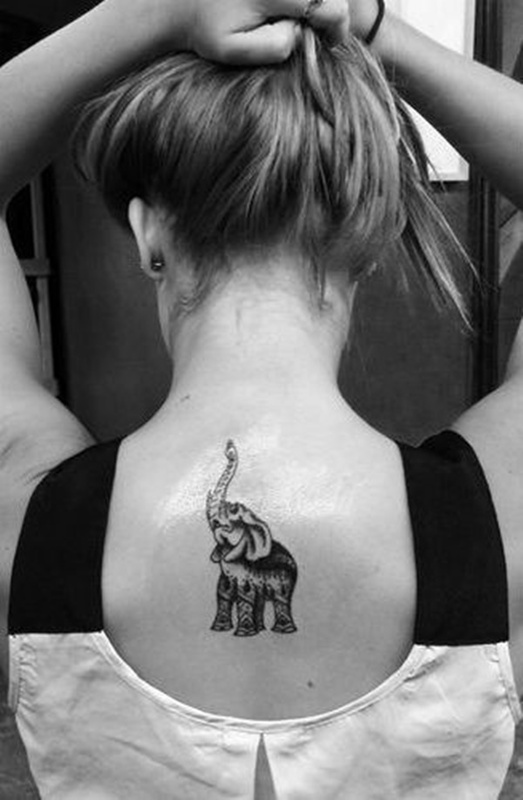 Another example of an elephant covered in a mandala pattern is seen in the center of the wearer’s back in this tattoo. 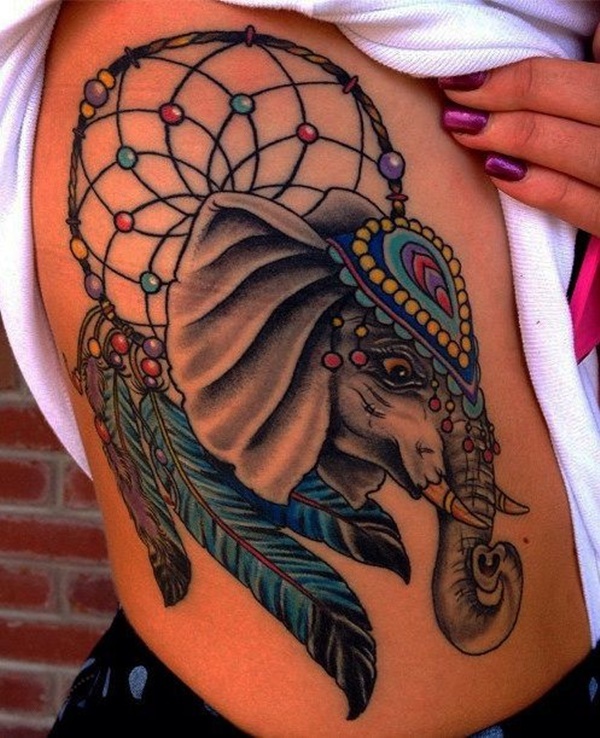 An elephant with a small headdress accompanies a dreamcatcher in this ornate tattoo that utilizes a color palette primarily consisting of blue. 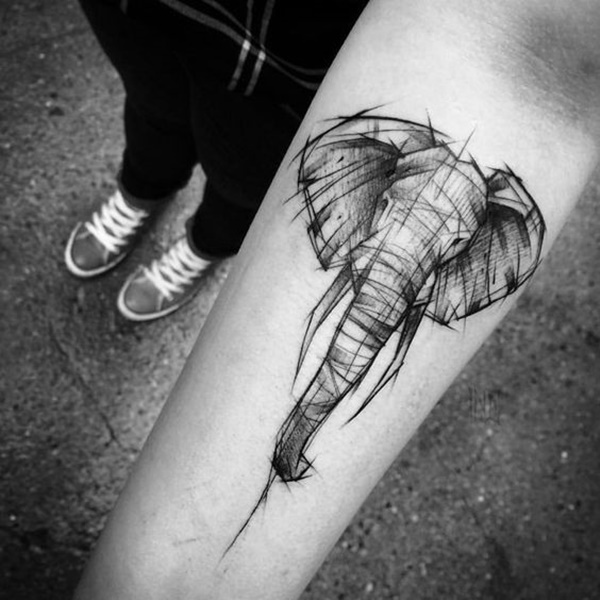 A hyper-realistic elephant portrait is created using black and gray ink in this tattoo. 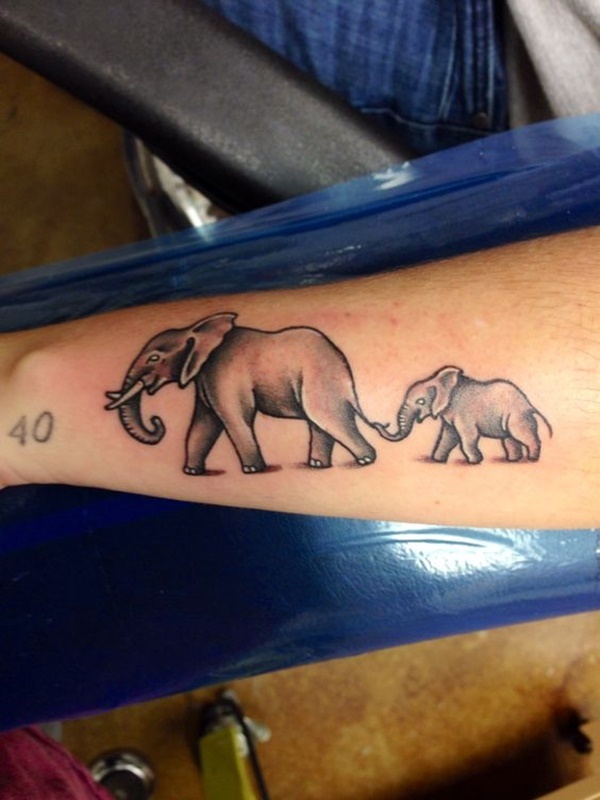 A mother elephant is portrayed with her baby walking behind her with the babies’ trunk wrapped around her tail. 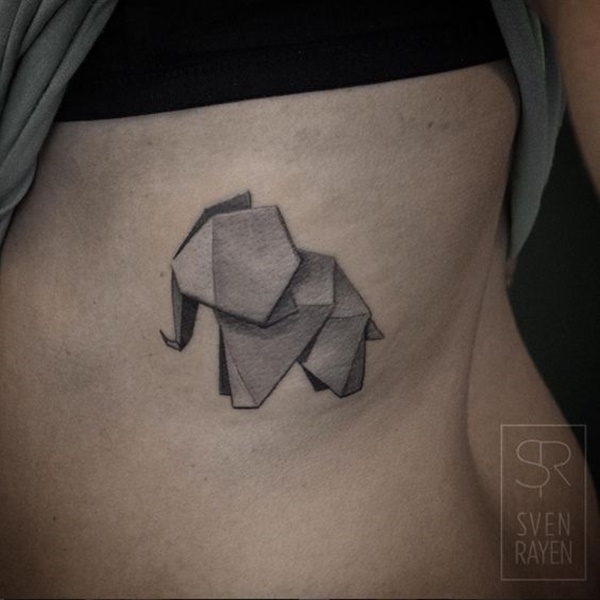 An origami elephant is portrayed in black and gray ink in this tattoo. 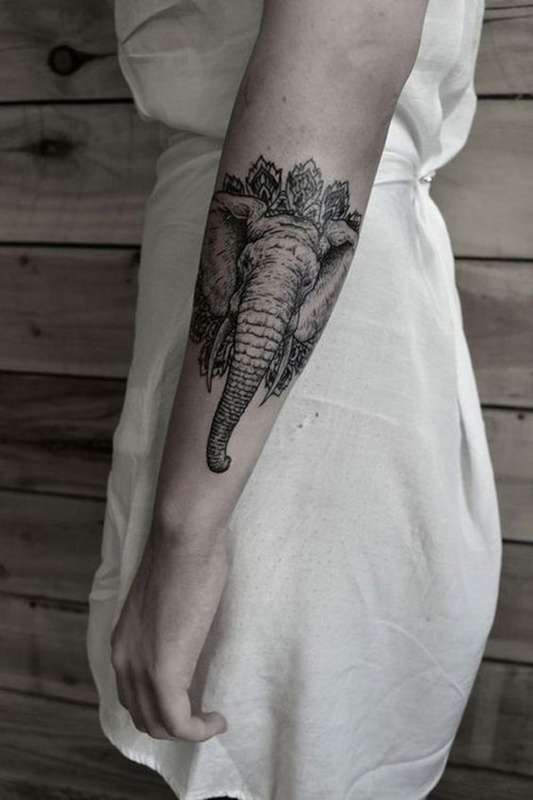 An elephant embellished with a mandala pattern is portrayed looking upward in this black and gray tattoo. 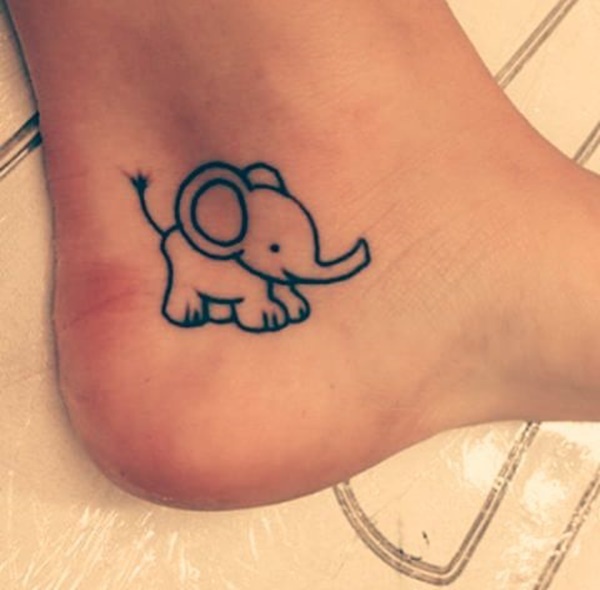 The word, “Elephant,” is written in a way that the word creates the outline of an elephant. 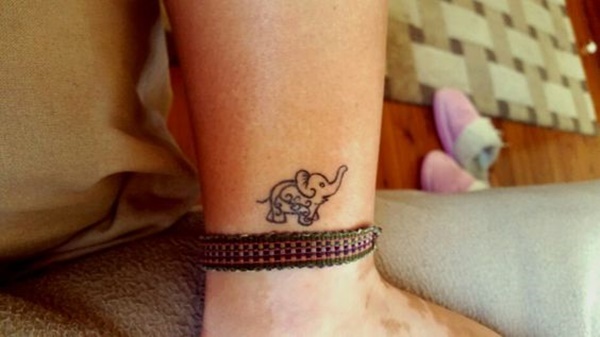 A simplistic rendering of an elephant covered in a mandala pattern is portrayed on the wearer’s ankle. 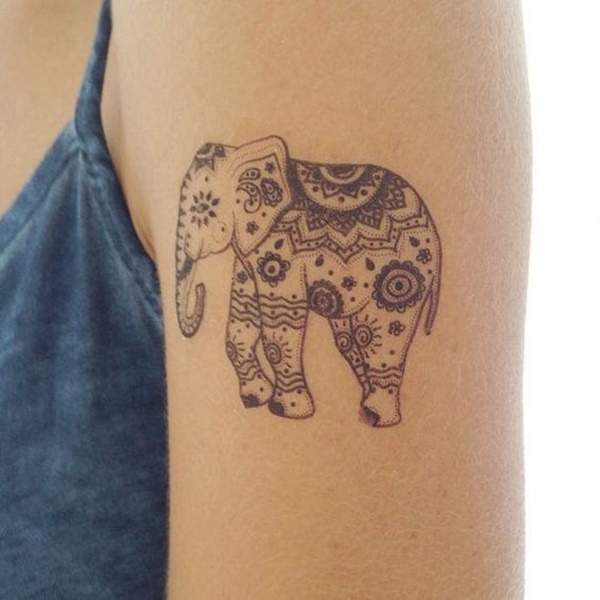 Another example of a simplistic elephant portrait covered in a mandala pattern is seen here. 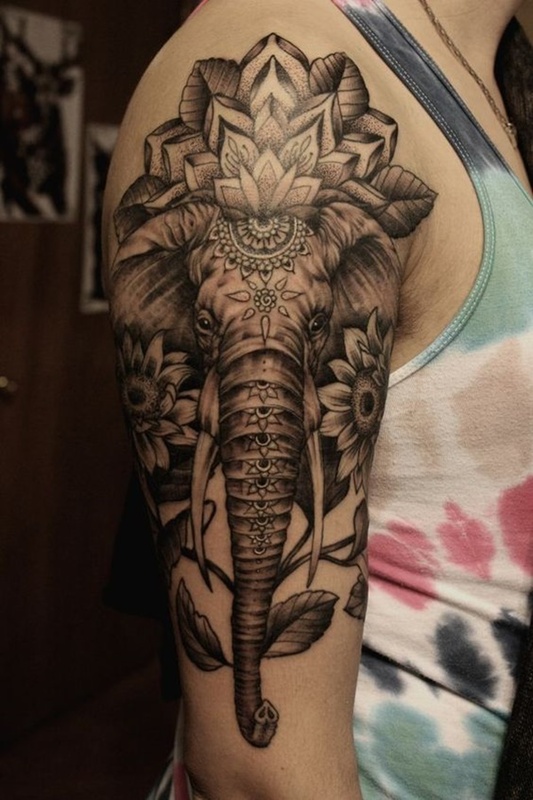 A black and gray elephant portrait is embellished with an ornate pattern in the background. 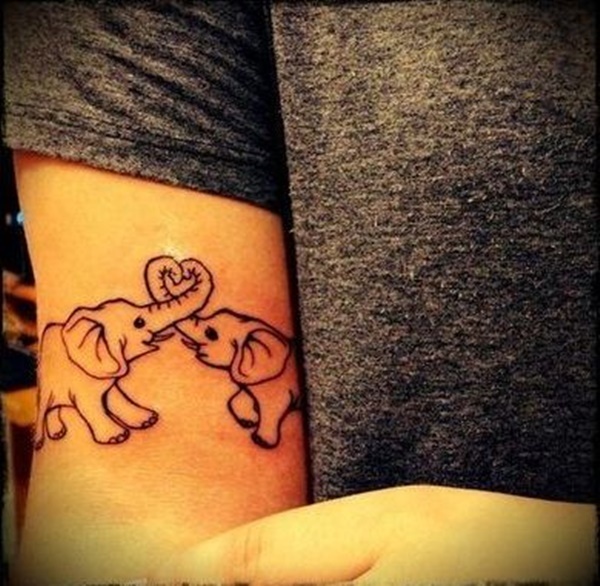 A pair of elephants wrap their trunks into the shape of a heart in this black tattoo. 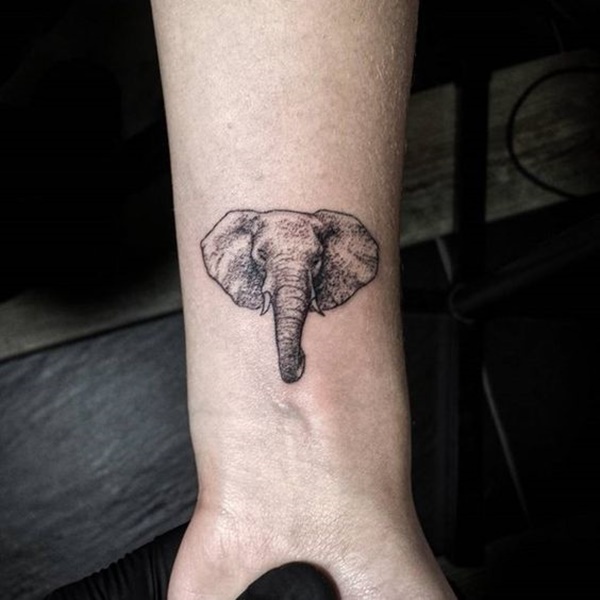 Another example of a single line composing a portrait of an elephant is seen in this black tattoo rendered on the wearer’s arm. 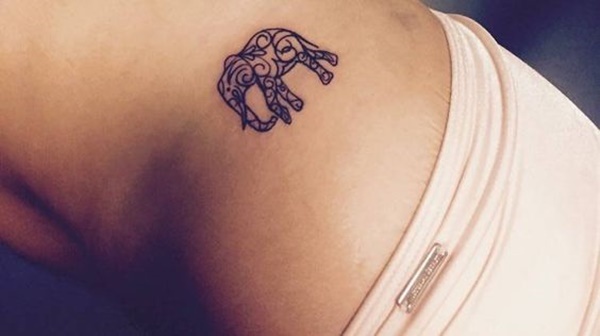 An elephant covered in a mandala pattern is rendered in black ink on the wearer’s hip in this tattoo. 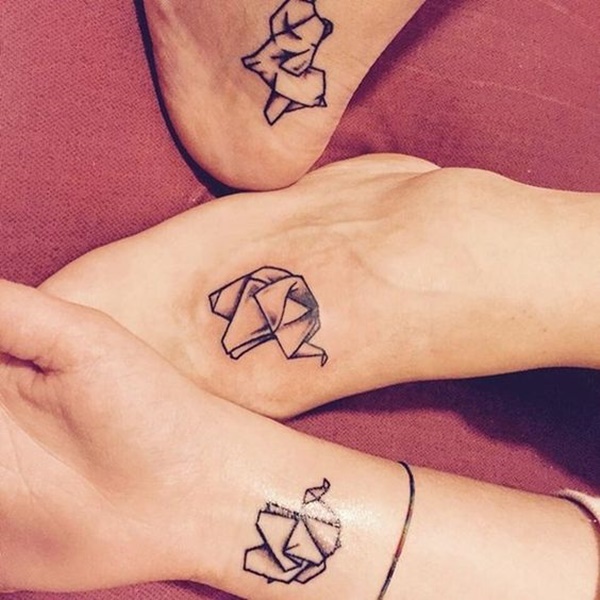 A trio of origami elephants are seen tattooed on various parts of the wearers’ bodies in this black and gray tattoo set. 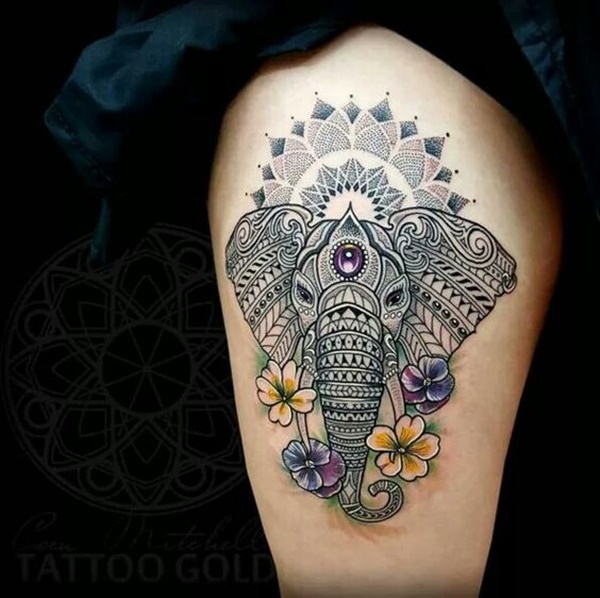 This tattoo uses multiple elements of tattoos we’ve seen previously by combining the mother and child theme with mandala patterns. 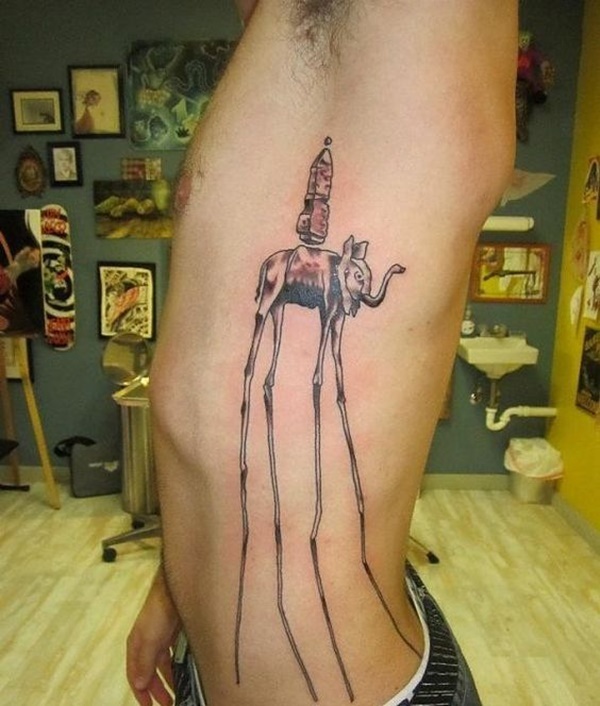 An abstract portrait of an elephant is portrayed with absurdly long legs in this black and gray tattoo depicted on the left side of the wearer’s torso. 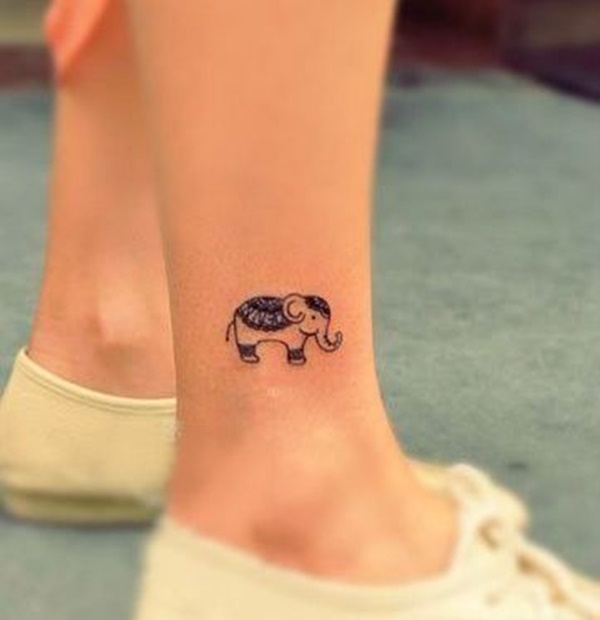 A simplistic rendering of an elephant is portrayed in black ink near the wearer’s heel in this tattoo. 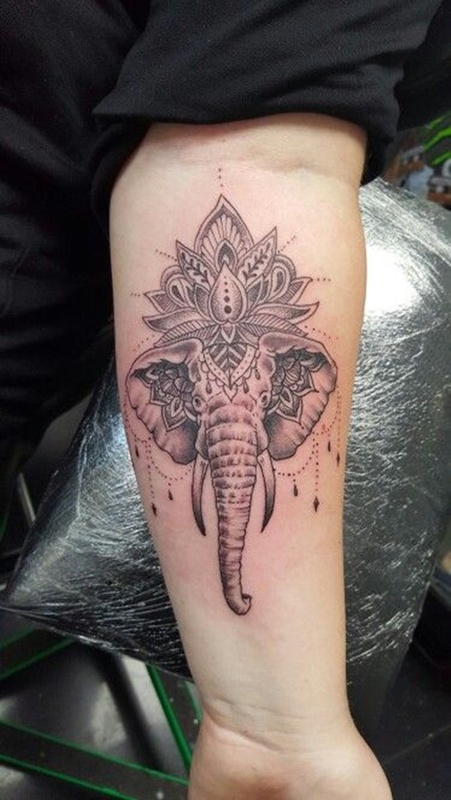 Another example of an elephant mandala is seen here with the design in the center of the elephant’s head colored with blue, orange, and yellow. 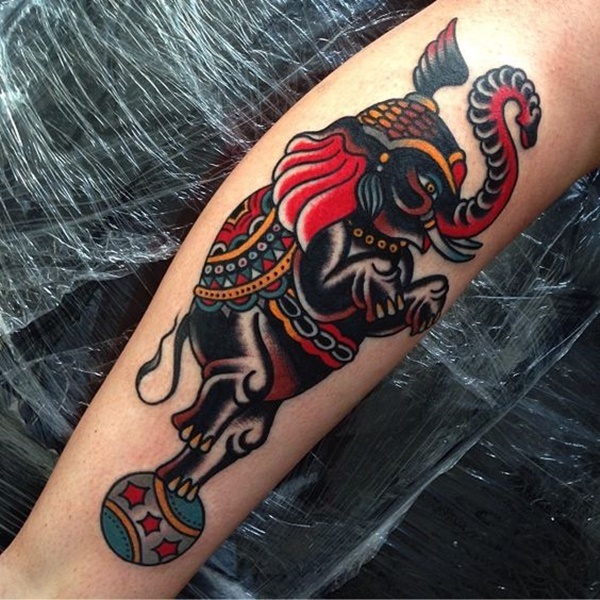 A black and red elephant is illustrated in the traditional style as it stands atop a ball. 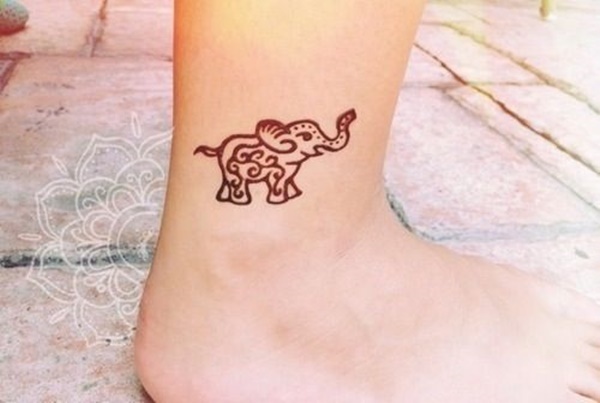 Another example of an elephant covered in a mandala pattern is seen here with its head lifted upward toward the sky. 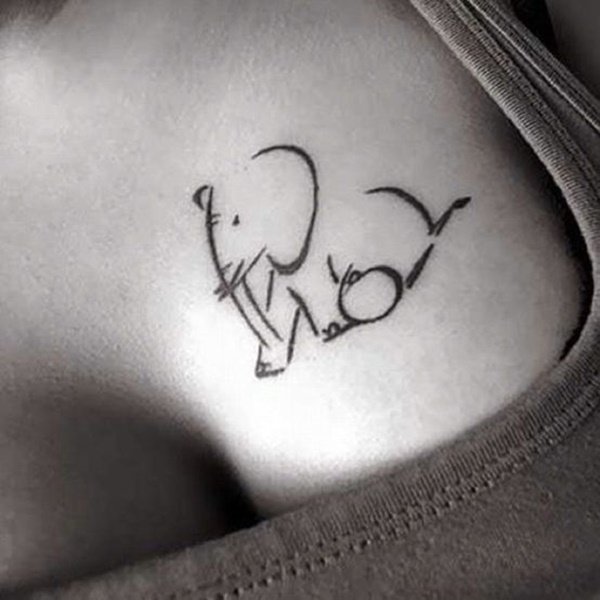 A simplistic elephant outline is created using black ink and is illustrated on the wearer’s left breast. 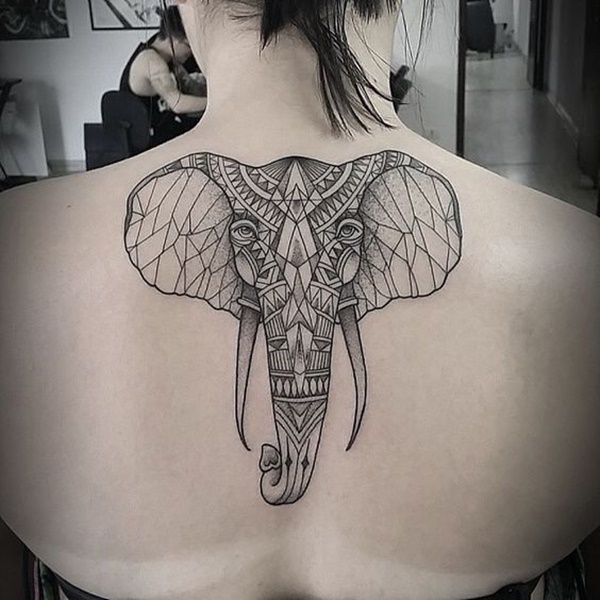 Yet another example of an elephant covered in a mandala pattern is seen between the wearer’s shoulder blades in this tattoo. 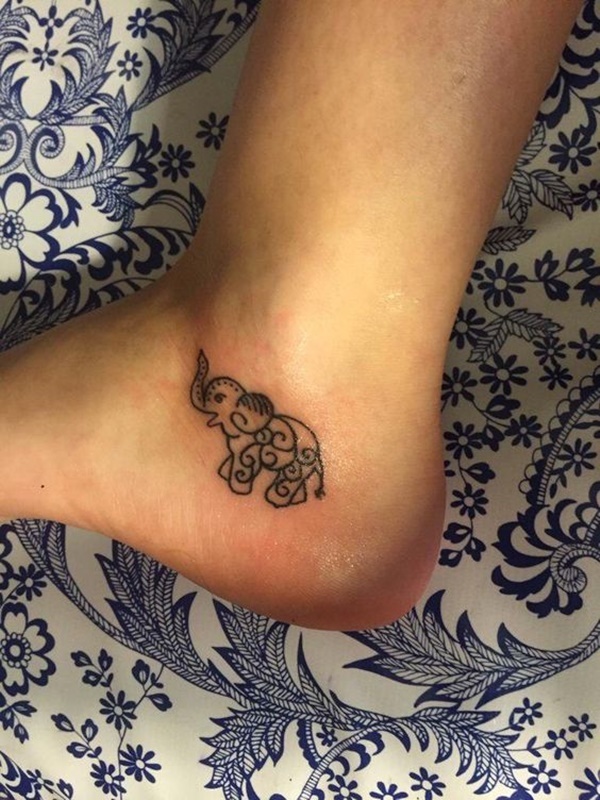 A cartoon style elephant is illustrated on the wearer’s foot in black ink with a heart at the end of its trunk in this tattoo. 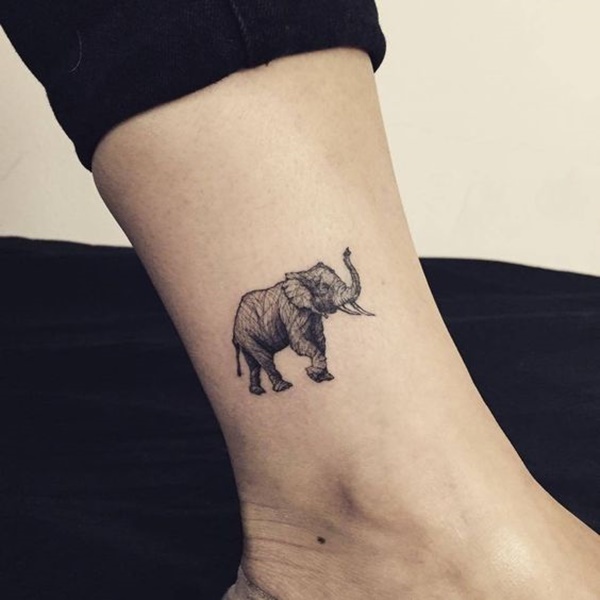 An elephant inked in a style reminiscent of a sketch is portrayed on the wearer’s forearm in black and gray ink in this tattoo. 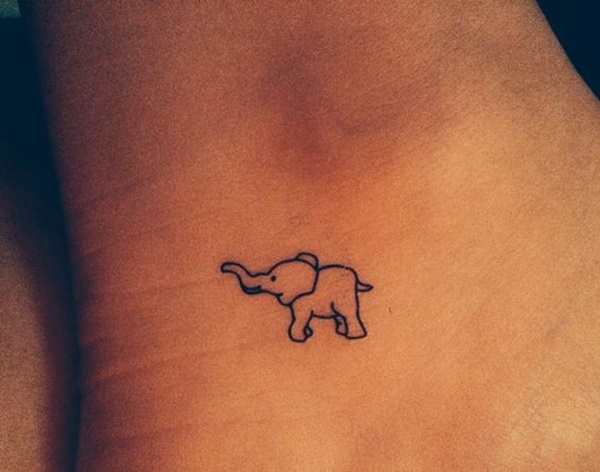 An elephant with a concernedly bulbous trunk is portrayed on the wearer’s forearm in black and gray ink. 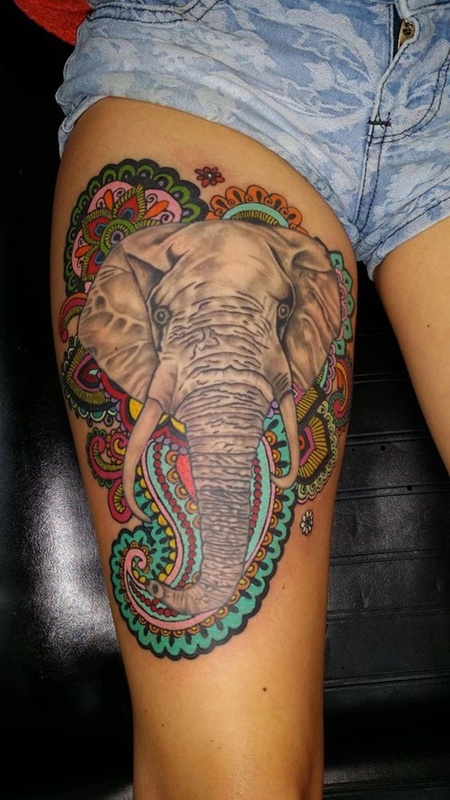 An elephant that looks like its just dropped a bad tab of acid is surrounded by a colorful array of patterns in this vibrant tattoo. 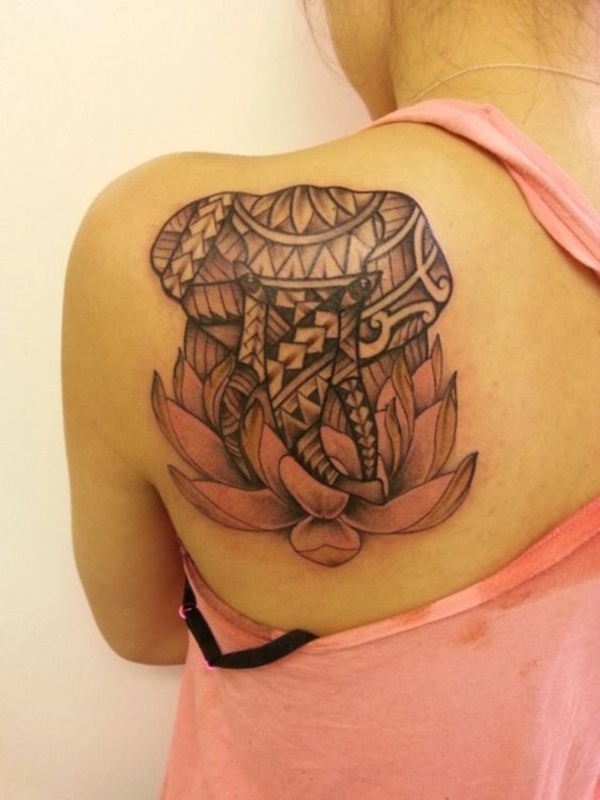 A faceless elephant is detailed with a series of dots and elements commonly seen on mandalas in this tattoo. 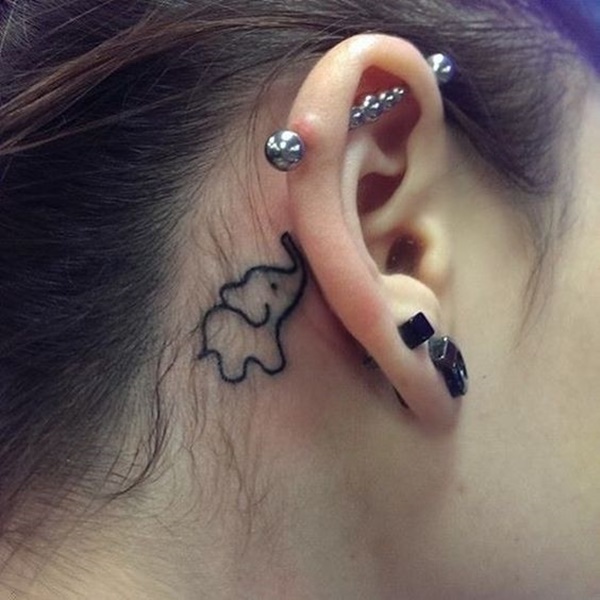 A cartoon style elephant illustrated in black ink behind the wearer’s right ear in this tattoo. 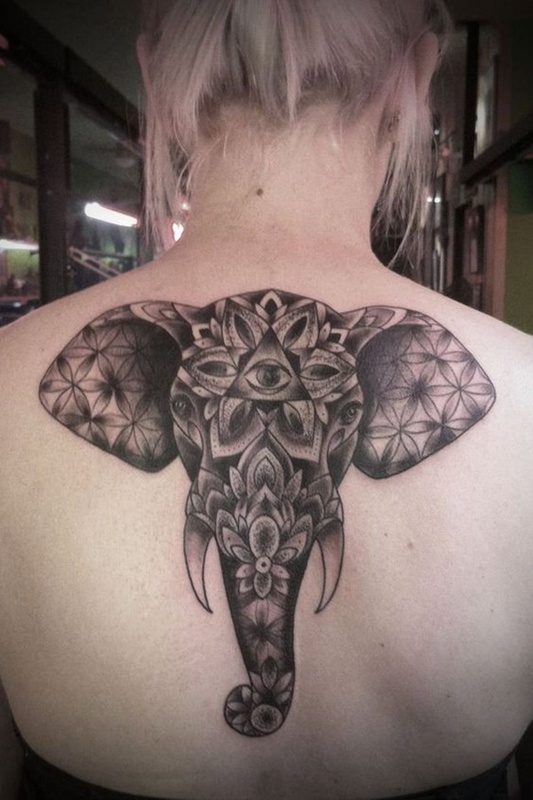 A striking example of an elephant covered in a mandala pattern. 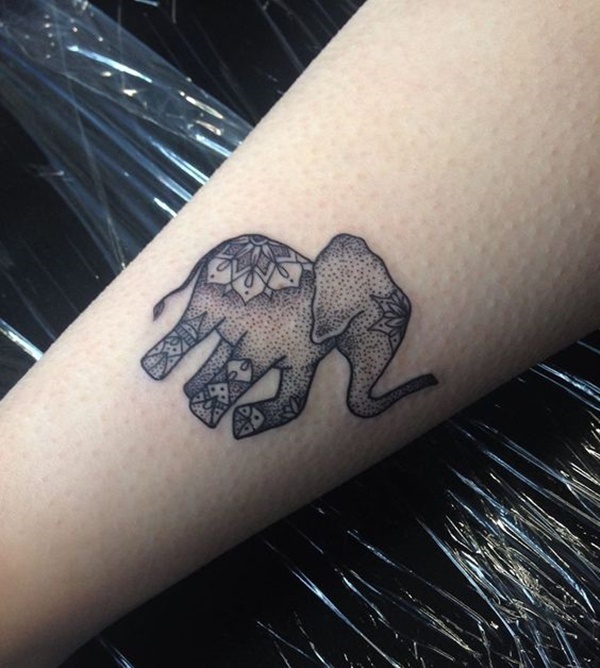 A simple rendition of an elephant covered in a mandala pattern. 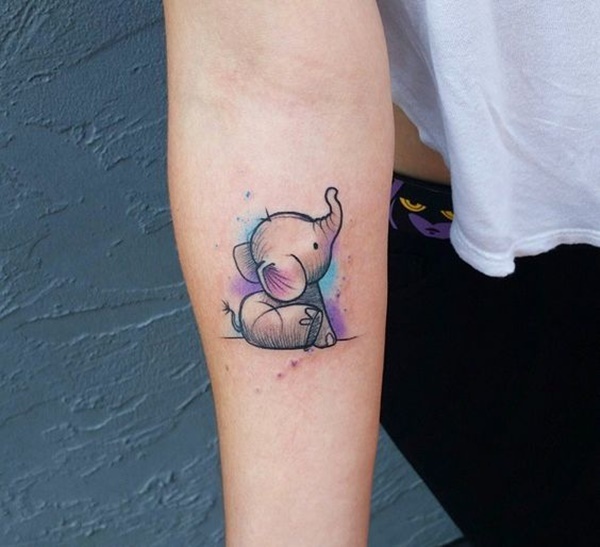 A cartoon style mother elephant hands a heart to her child in this tattoo. An elephant portrait is encapsulated in an ornate frame. 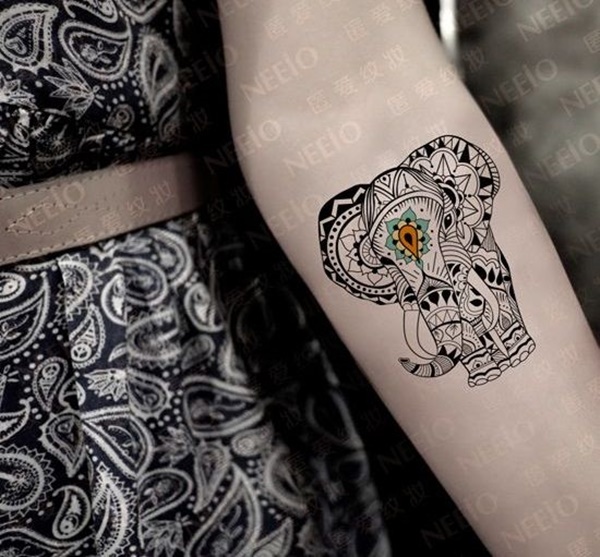 An elephant portrait is enlivened by covering the beast in an elaborate pattern. 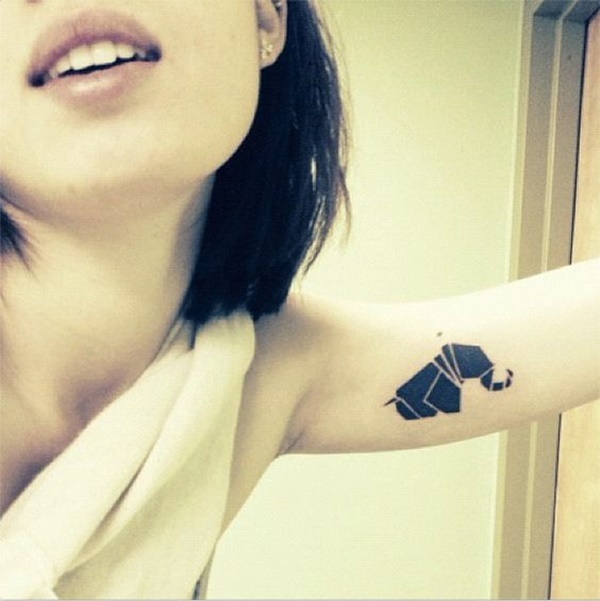 A simple blacked out illustration of an elephant is portrayed in this photo. 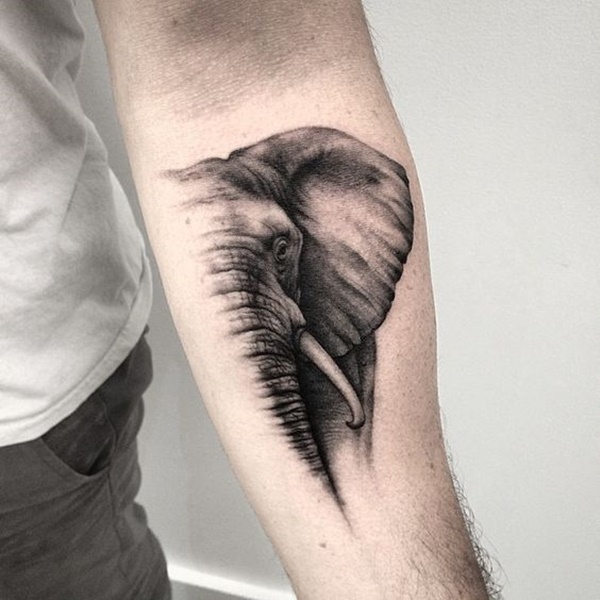 A hyper-realistic portrait of an elephant is seen here. 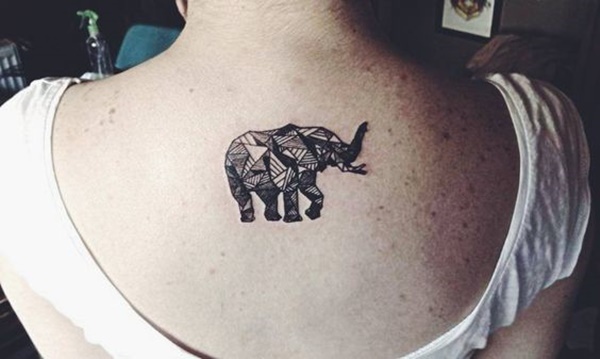 A silhouette of an origami elephant is seen in this photo. 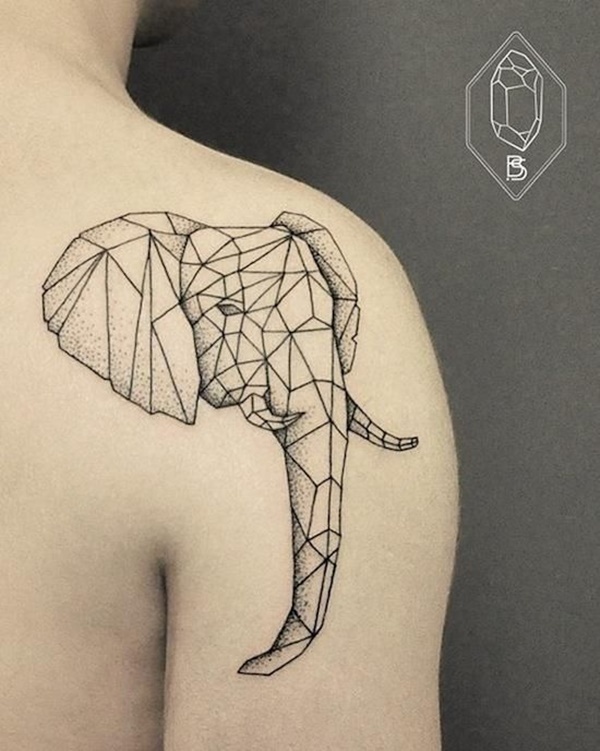 Geometric shapes are used to comprise the portrait of an elephant. 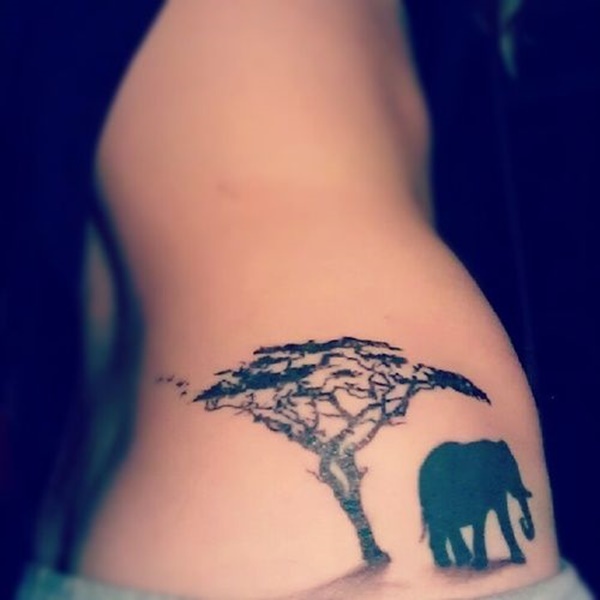 The silhouette of an elephant is seen next to a tree. 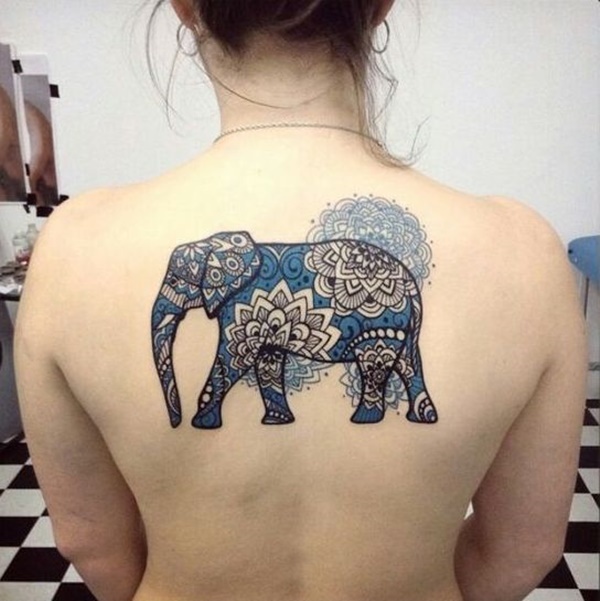 An elephant covered in a mandala pattern is colored in a primarily blue palette. 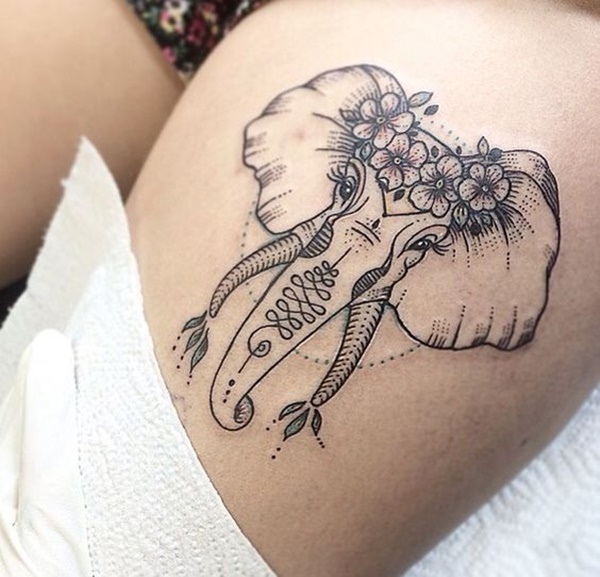 Oversized eyes typically create a cute effect in illustrations as seen in this tattoo of an elephant wearing a headdress and holding a flower. 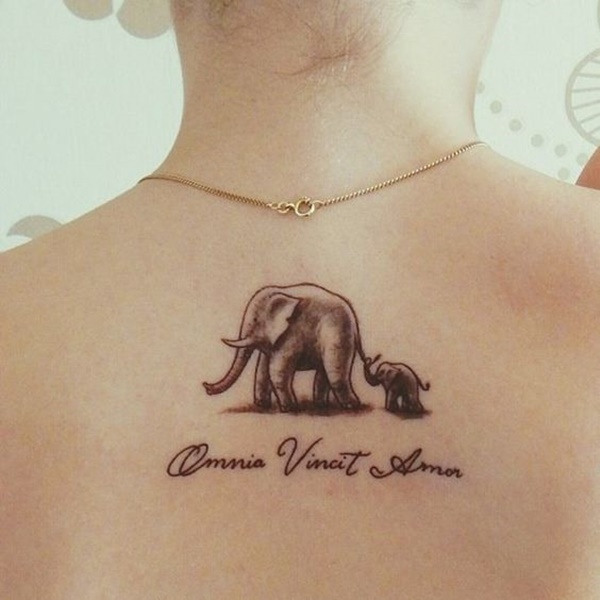 A mother and child elephant walk trunk to tail and are pictured above a quote. 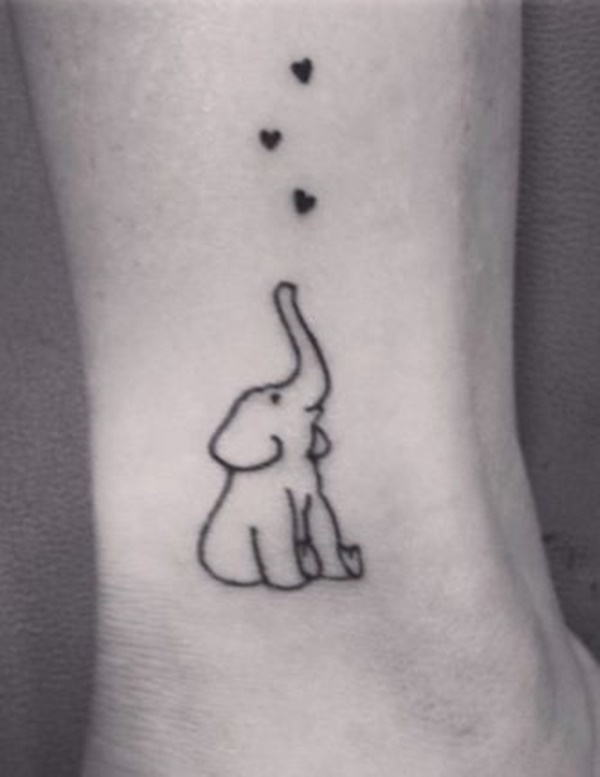 A seated elephant looks upwards toward a trio of hearts drifting into the sky. 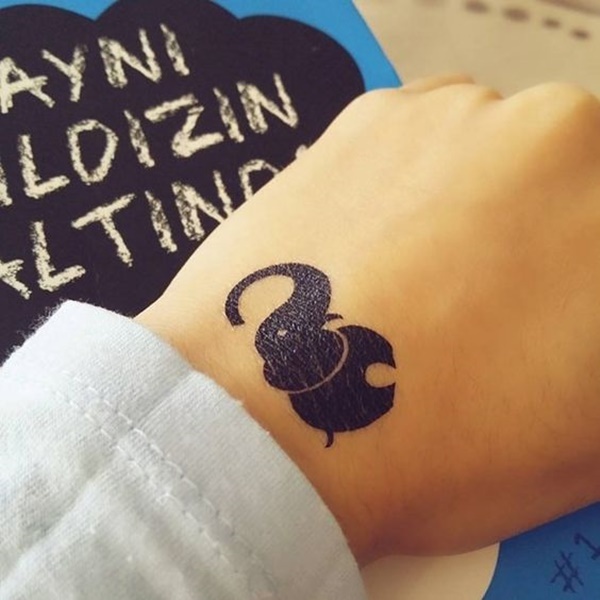 A simple depiction of an elephant is created using a black outline. 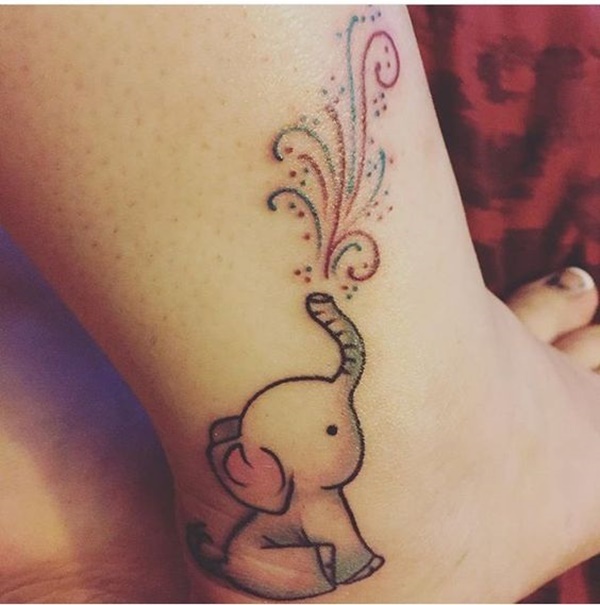 A seated elephant sits in front of a blue and purple background and blows hearts into the sky out of its trunk. 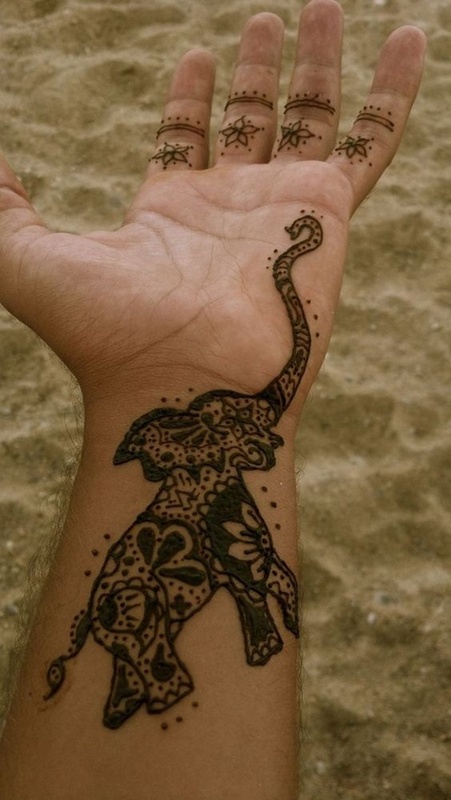 Another example of an elephant covered in a mandala pattern is seen here. 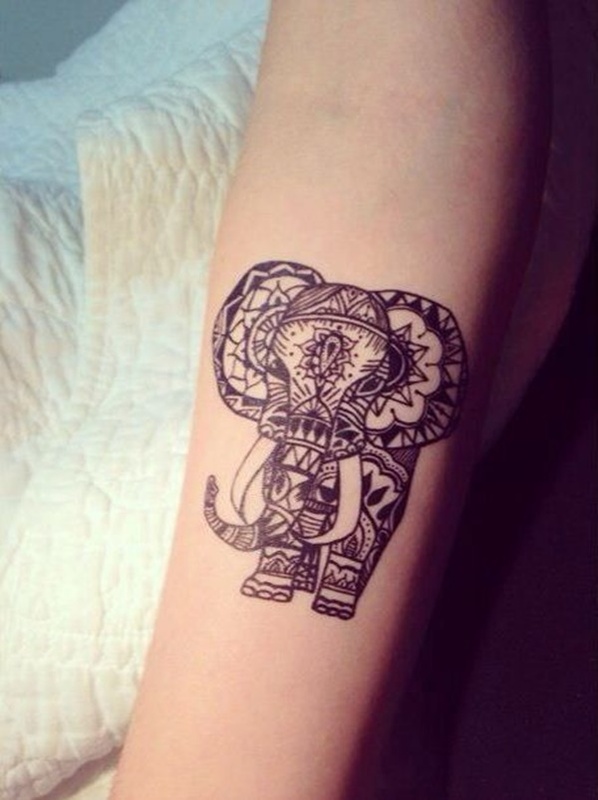 Once again, a mandala elephant. 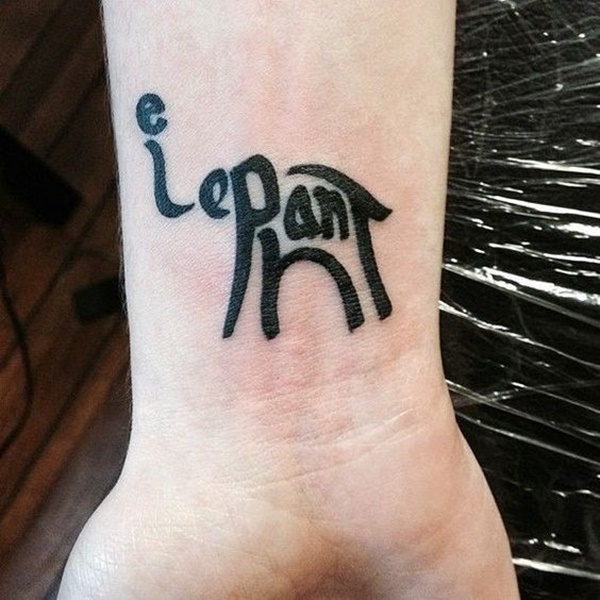 A simple elephant portrait is created using a black outline. 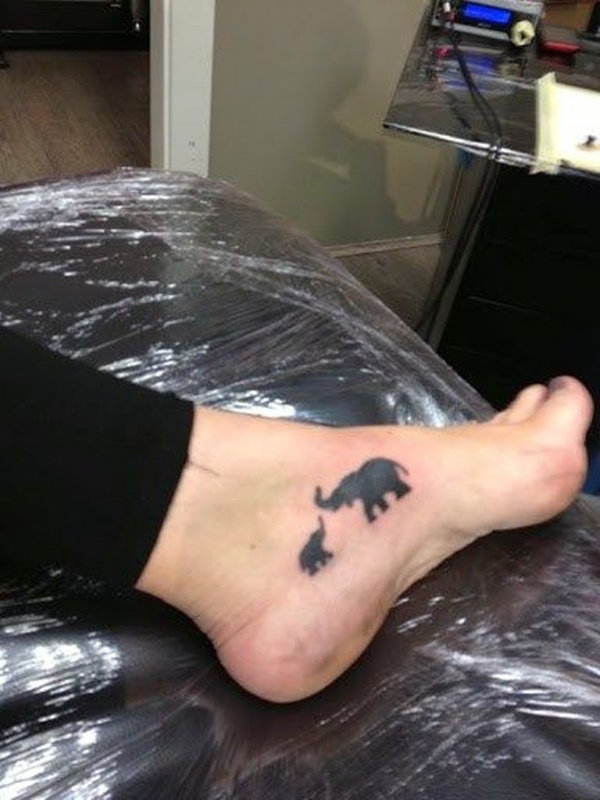 Silhouettes of a mother elephant and her child are seen on the wearer’s foot. 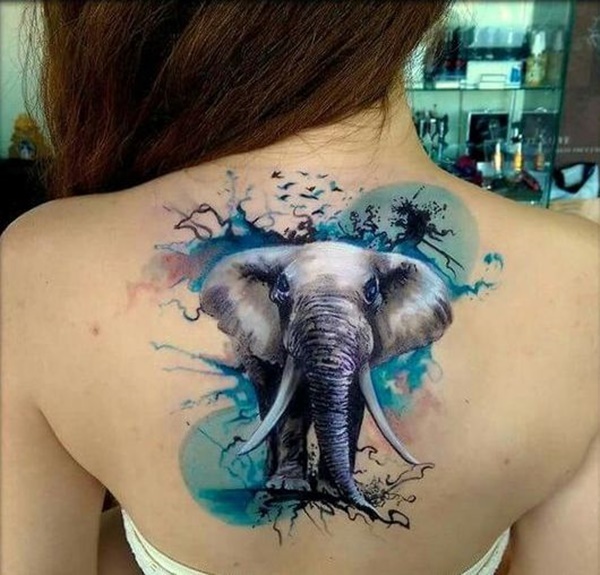 An elephant portrait is embellished with an abstract background utilizing a palette of electric blues. A graffiti-like portrait is created using a palette of blue, black, and red. 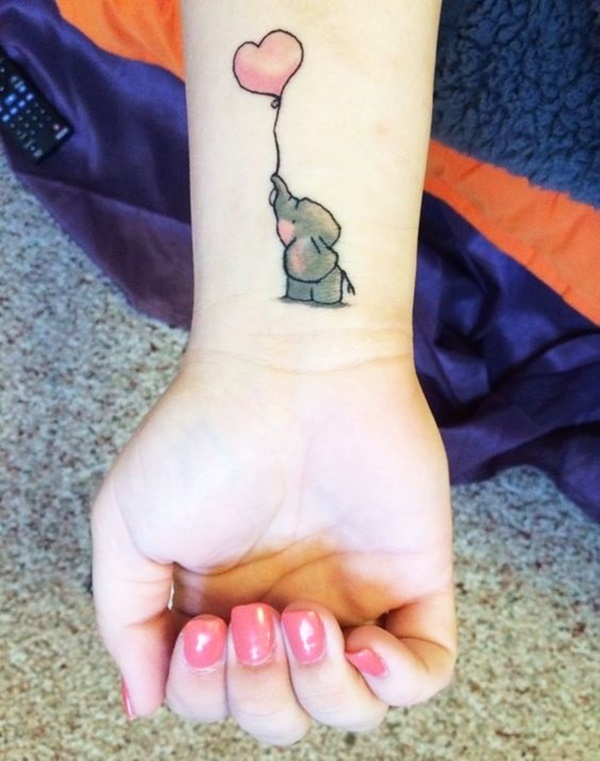 A cartoon style elephant holds a heart shaped balloon in this photo. 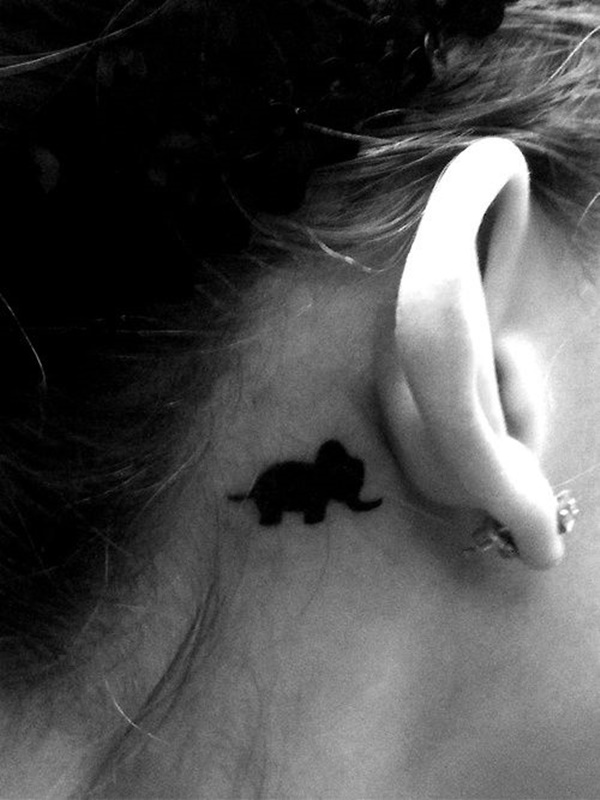 A black elephant silhouette is seen behind the wearer’s right ear. 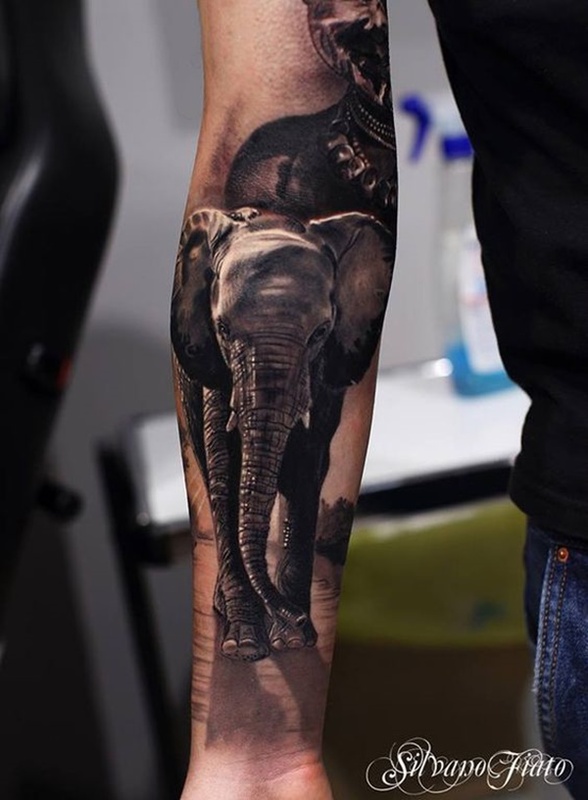 An elephant head portrait is seen on the wearer’s forearm. 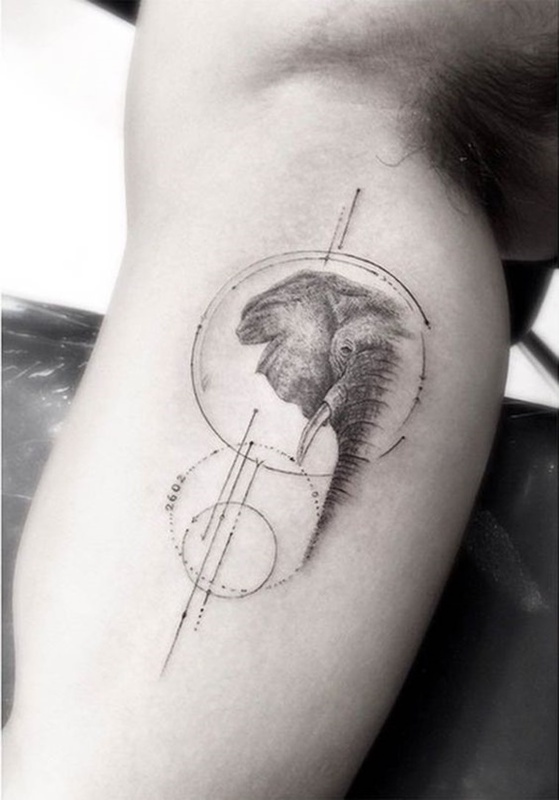 Half of an elephant portrait is encapsulated inside of a series of circles. 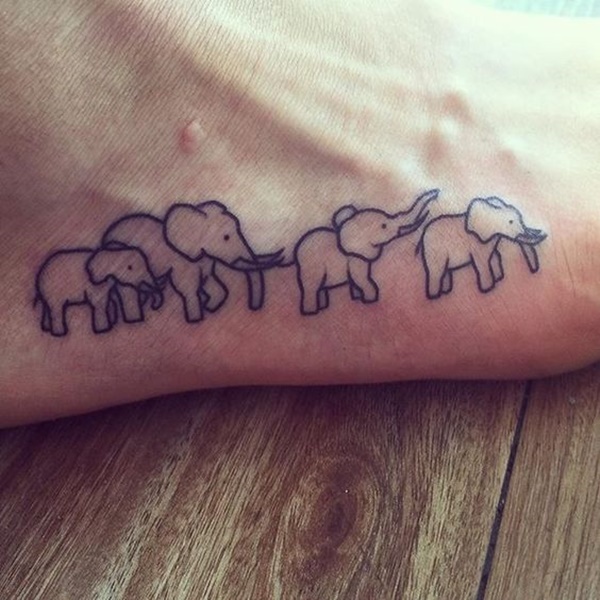 A trio of elephants is illustrated using black outlines. 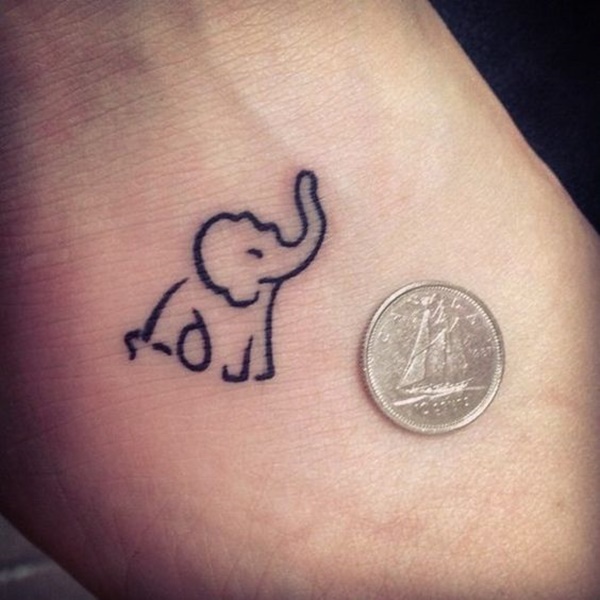 A mini elephant portrait is illustrated near the wearer’s heel. 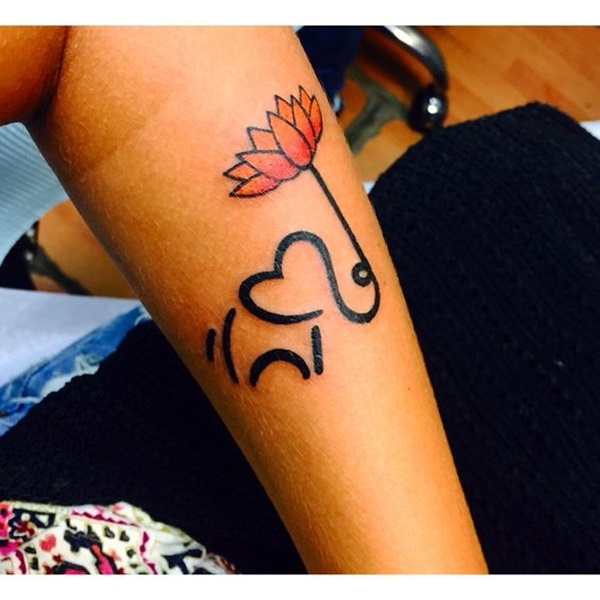 A bold, black outline creates the shape of an elephant holding an orange flower. 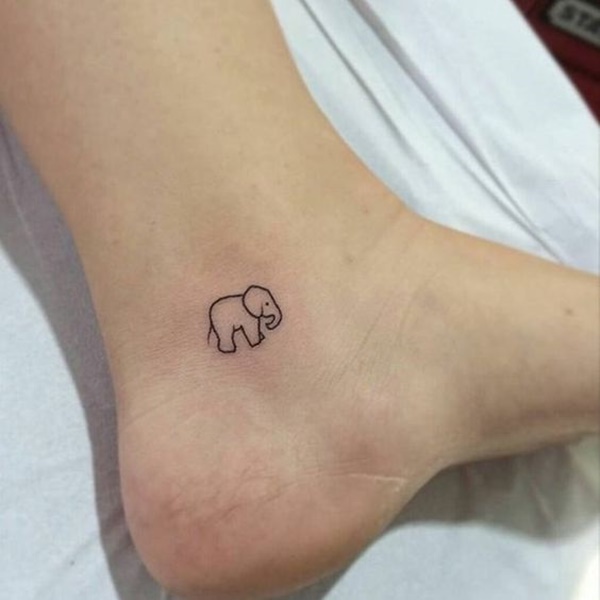 A small outline of an elephant is seen in this black tattoo. 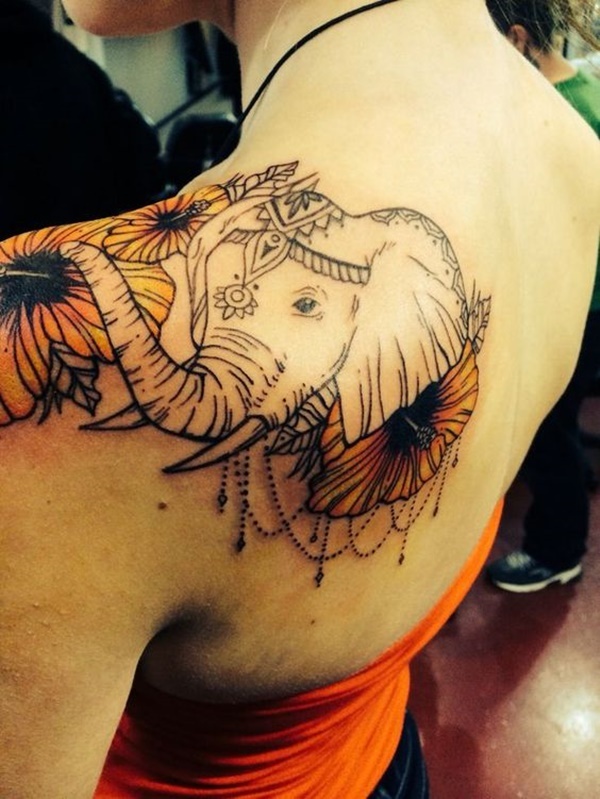 An elephant with a headdress is adorned with a headdress, beads, and flowers. 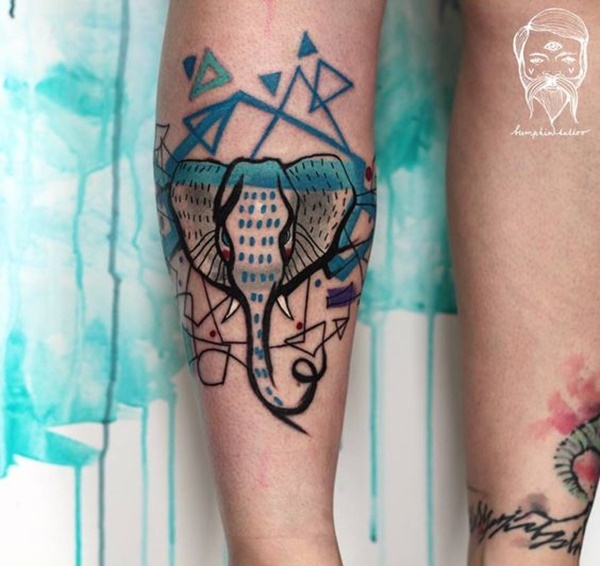 A seated elephant blows a stream of colors from its trunk in this tattoo. 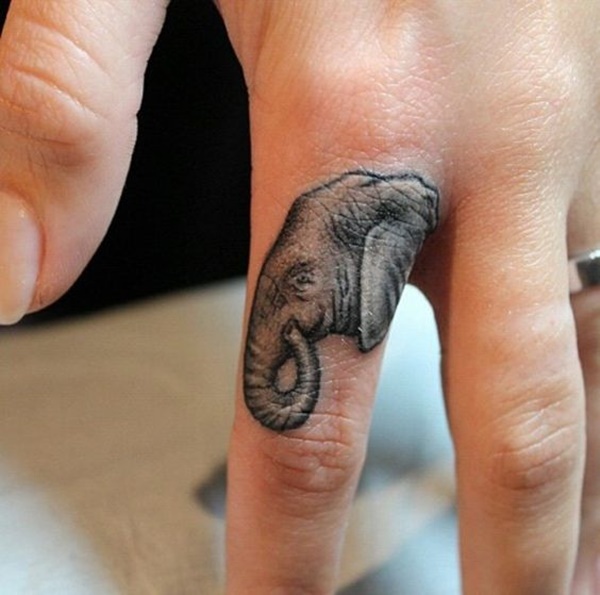 An elephant head is portrayed on the wearer’s index finger. 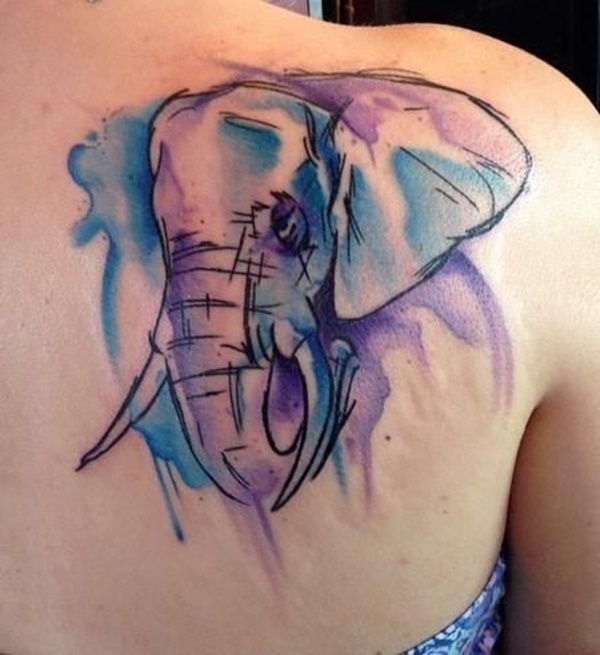 An elephant portrait is colored with a blue and purple watercolor smear. 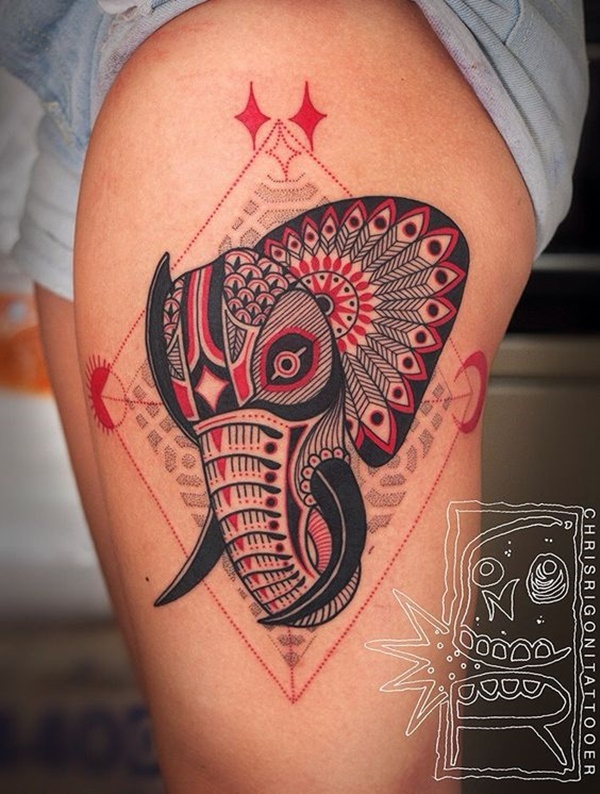 An elephant portrait is embellished with mandala elements and illustrated over a red background. 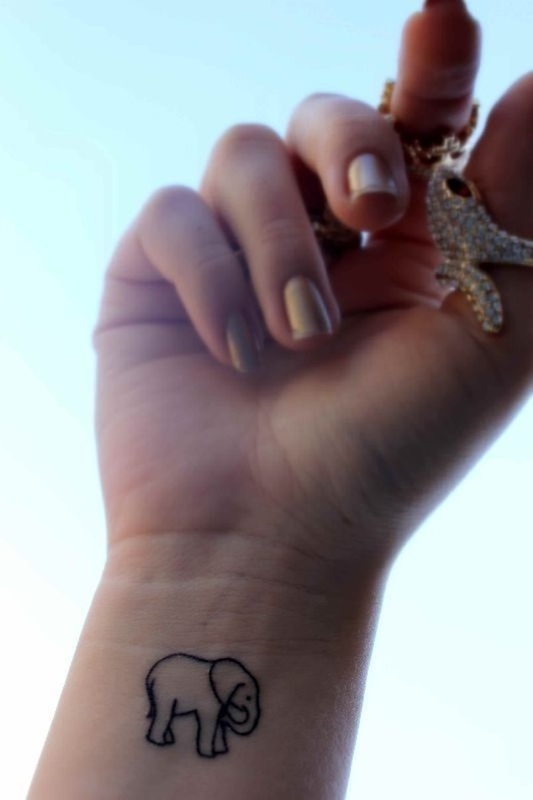 If you’ve seen it once, you’ve seen it a million times, you’ve seen it a million times. Oh, hey that looks familiar. For the love of god add an original element to the image! 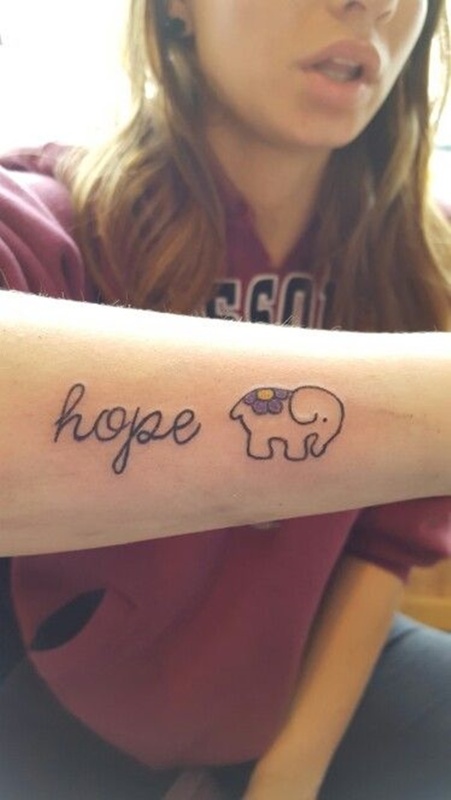 The word, “Hope,” accompanies the cartoon style image of an elephant. 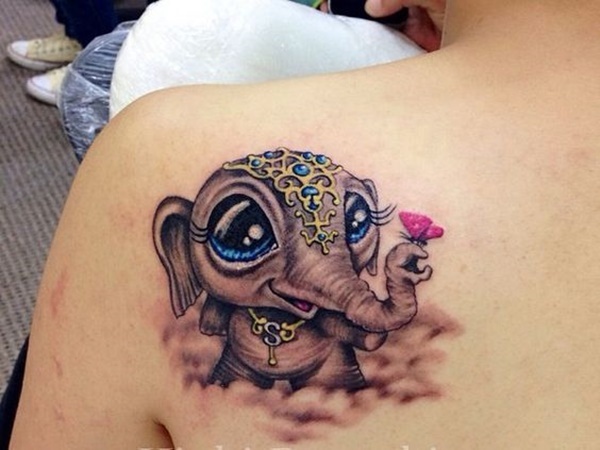 At least this one has a jewel in the center of its head and a few flowers to accent the main image. 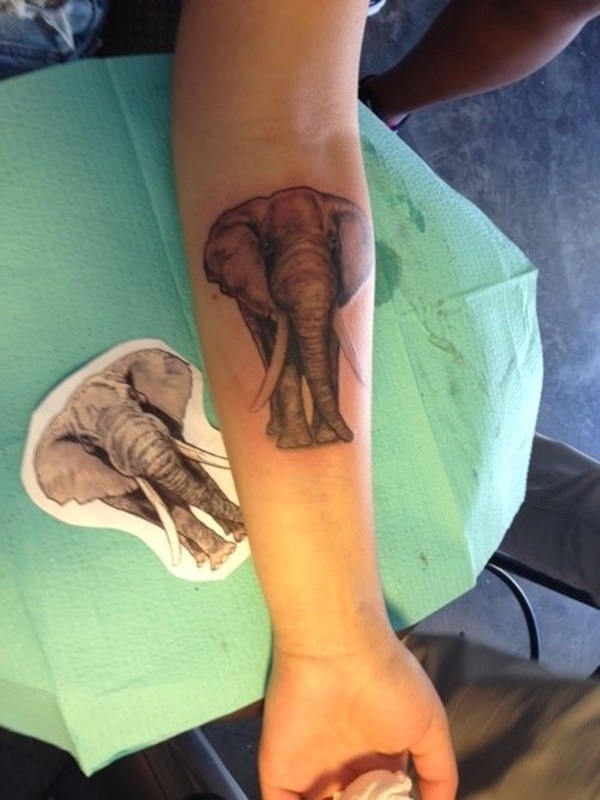 Half a black and gray elephant portrait is seen on the wearer’s forearm. 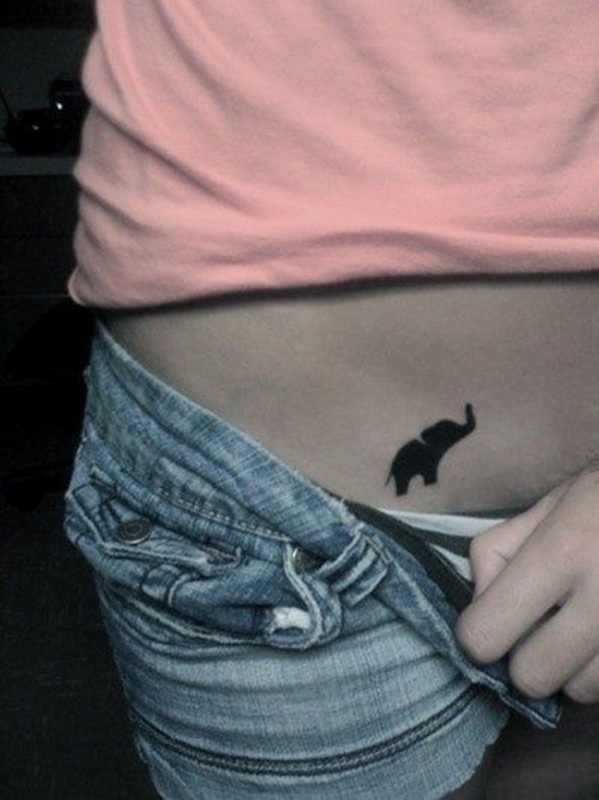 This photo shows an elephant silhouette, and just a dash of pubic hair. 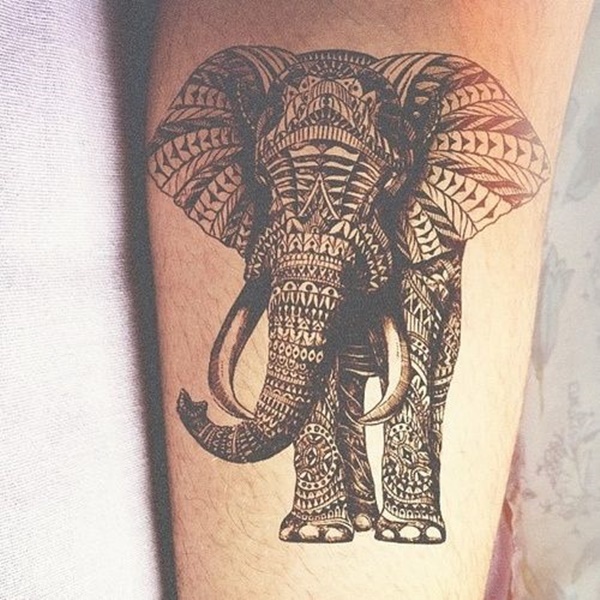 It’s an elephant covered in a mandala pattern, pretty cool, huh? 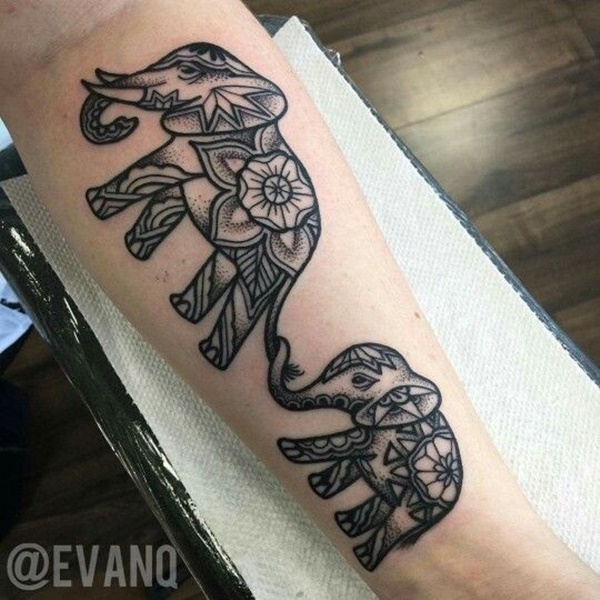 An elephant is comprised of geometric shapes and mandala patterns in this tattoo. 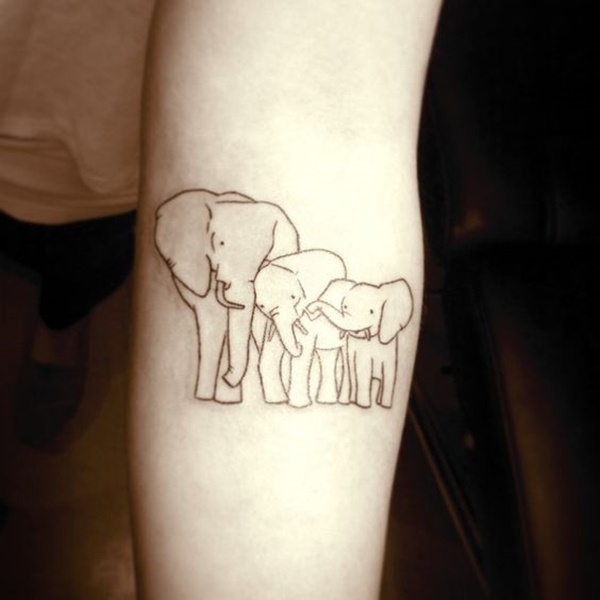 A herd of elephants is created using black outlines in this tattoo. 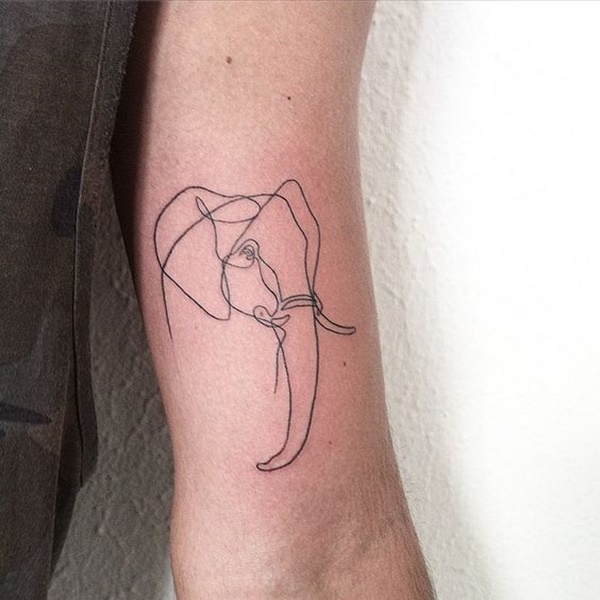 A complex portrait of an elephant is created using mindful line-work in this piece.